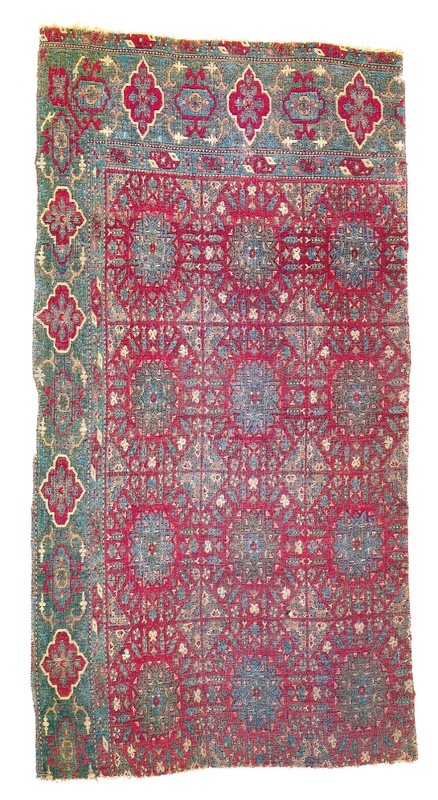 This catalogue of Saryk Ensi divides the carpets into two groups. The two animal-meander borders to the left and right of the central panel define these divisions. In Group A the pattern is larger in relation to the outer flower border ( or tree-of-life) In Group B the meander has been downsized to harmonise with it. Whether this is an indication of age is impossible to say, and there are items which straddle both groups. Group A, here denoted as with ”Wide Inner Border” divides fairly neatly again into two subgroups with drooping and upright flowers. The drooping flower group has been further divided into two last “containers” described as “multiple blossoms” and the “simple form” This last subdivison has also been employed for Group B. 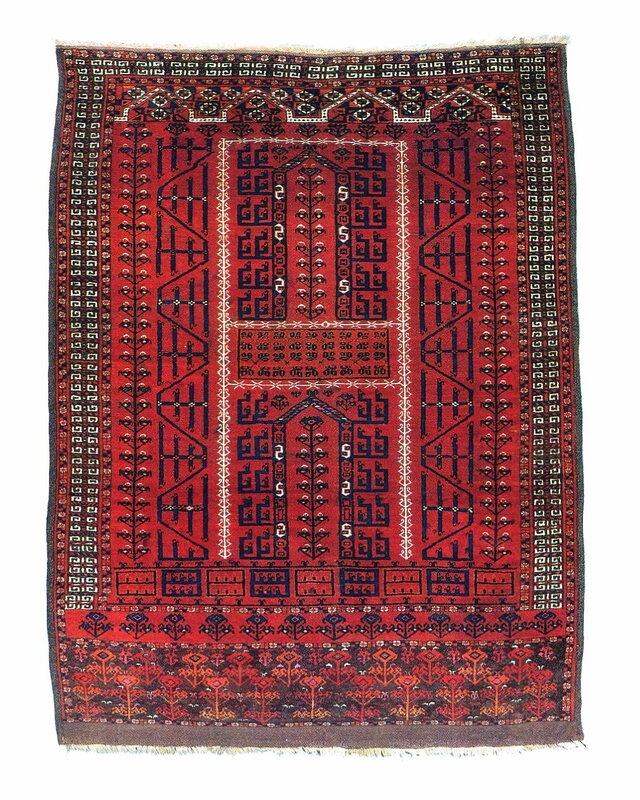 1) Sold at Sothebys New York on 12 December 1997 (Lot 70) for $87,750.With a blue-ground central panel surrounded by a Peikam inner border, which can sometimes be seen on Tekke torbas.Four carefully fitted Kibitka designs crown the field, each with a 2/3 depiction of an 8-pointed star. According to Hali(97-140), some white cotton has been used in the pile. Later with Ben Fernandes, Singapore.135 x 183 cm. 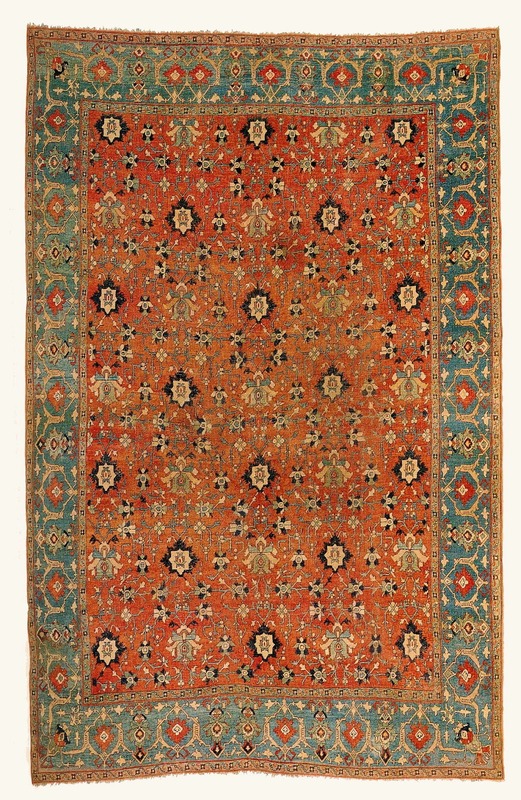 2)A carpet from the Heckscher Collection, San Francisco, shown here in reconstructed form.Very elegant, but visually more robust than the Fernandes rug.No cotton.Approximate original size:130 x 185 cms. 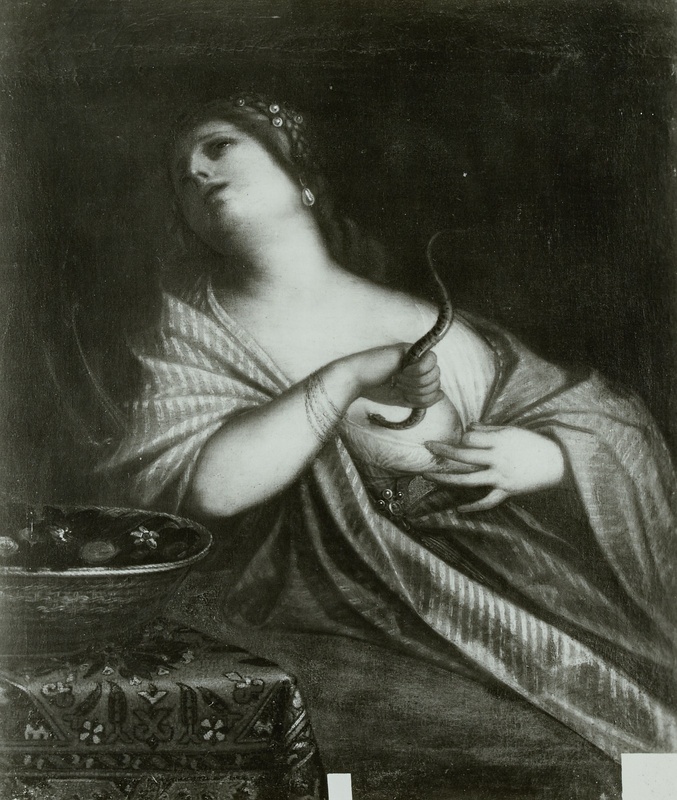 3)From the Wiedersperg Collection, now in the Museum of Fine Arts, San Francisco. An unusual effect is the loss of colour intensity in the red field. Jon Thompson felt it might have been improperly washed. Prolonged exposure to light could also be the reason for its pallid appearance.No cotton. 132 x 173 cm. 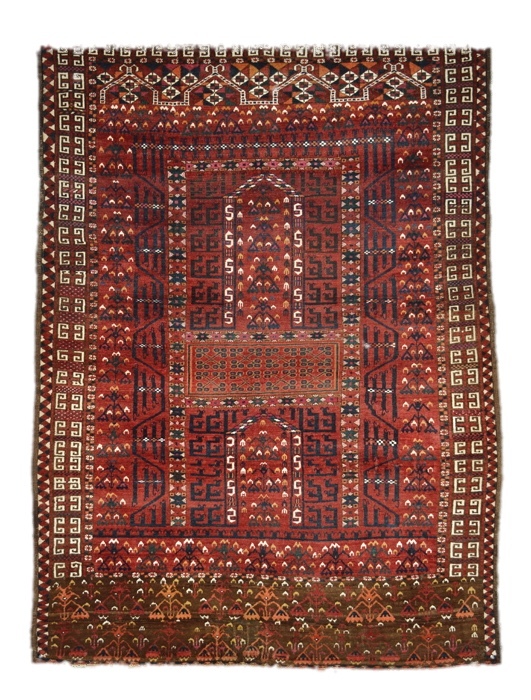 5)Sold at Rippon-Boswell`s on 17 May 2003 for $31,490, from the collection of M.E Bramwell. 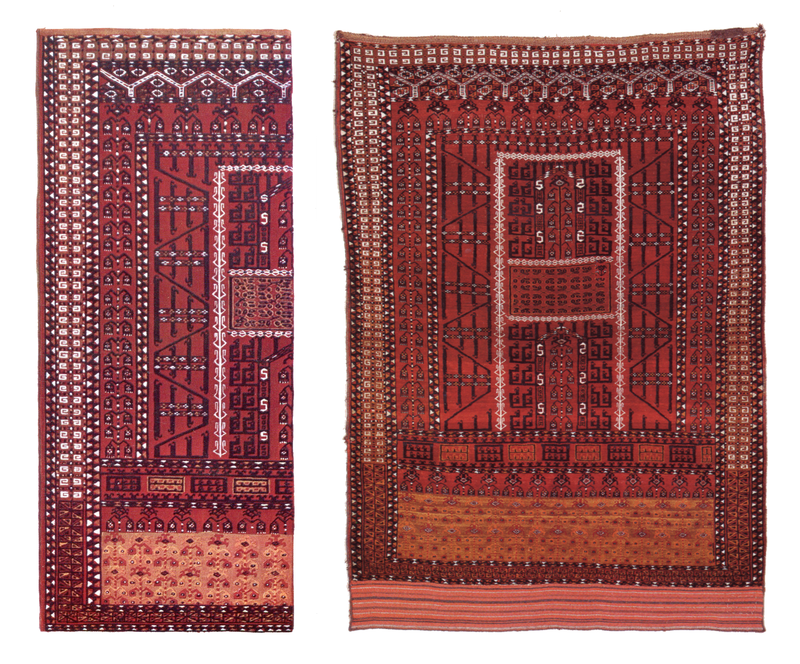 Comparing the Sainak border to the inner areas of white, they appear to be worked in cotton. The knot-count seems higher in the vertical, judging by the shape of the large flower border. 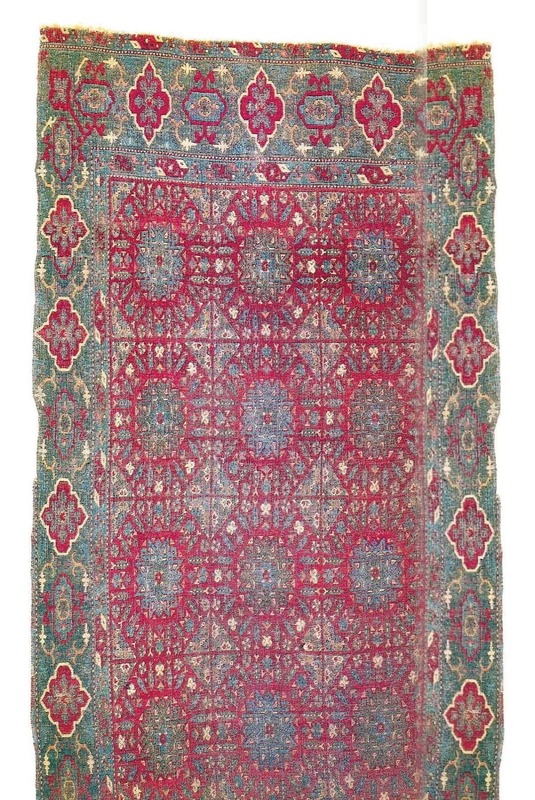 128 x 179 cm. 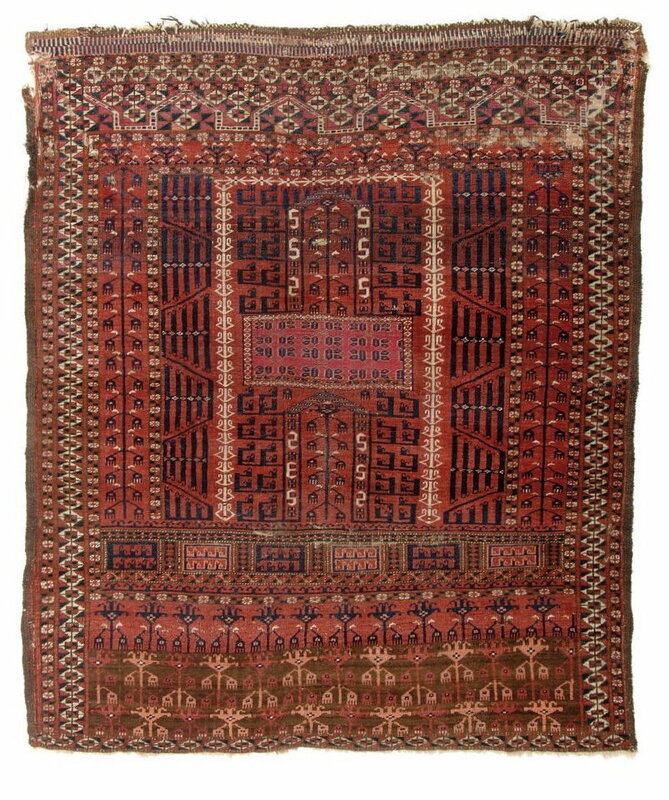 6) After a pre-sale report in Hali 183, where an attempt was made to line up the migrations of the Saryk tribe with corresponding artistic phases, this example from the Munkasci Collection sold at the AAC in Vienna for $27,340 on 9 May 2015 (Lot 217).Small areas of cotton and silk. 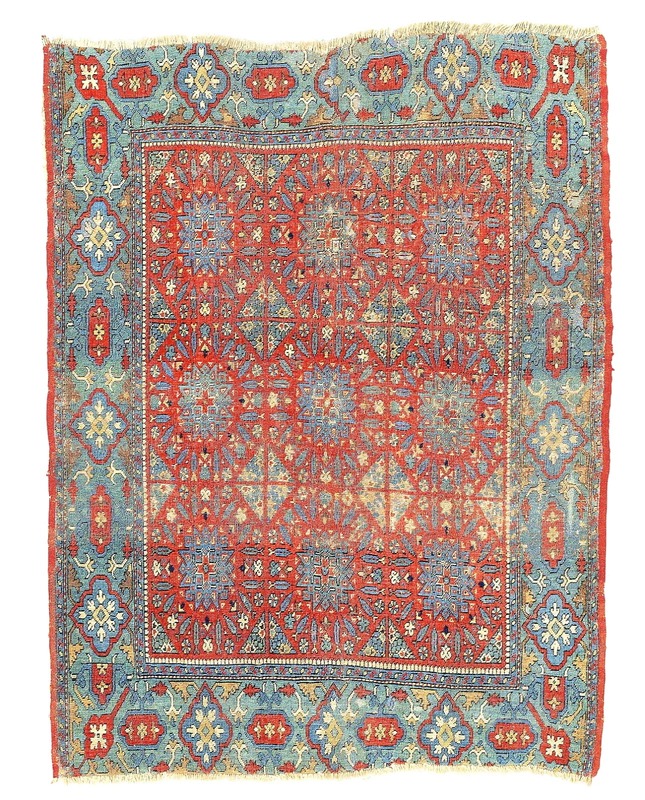 130 x 165 cm. 7)Published in the first Hoffmeister catalogue. A very lively fragment with white cotton.110 x 119 cm. GROUP A - WIDE INNER BORDER. DROOPING FLOWERS - SIMPLE FORM. 8) First published by Hartley Clark in 1922, this example appeared at Sotheby's on 18 October 1995 and was sold for $19,860.The drooping flower column is mirrored in the simplified Elem panel, already a sign of decay. The presence of cotton is not recorded. 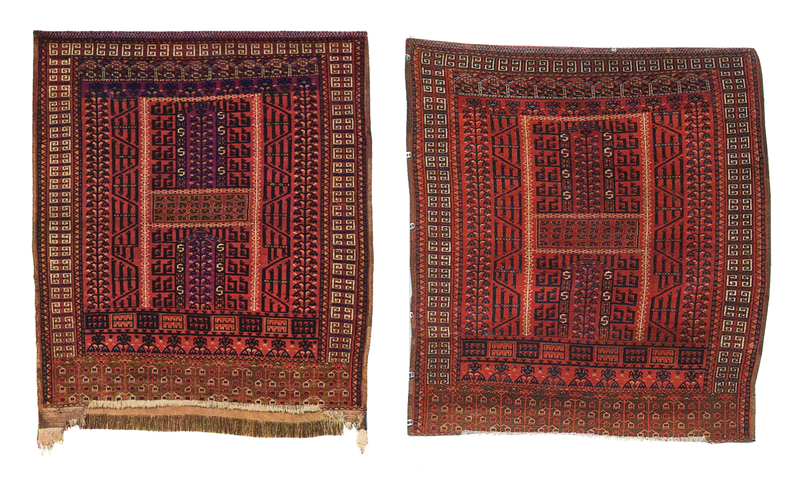 Three large areas knotted in purple have been magicked away for the Sothebys appearance, although the catalogue description does mention”magenta” Remnants of the original Kilim end and repair have been removed. 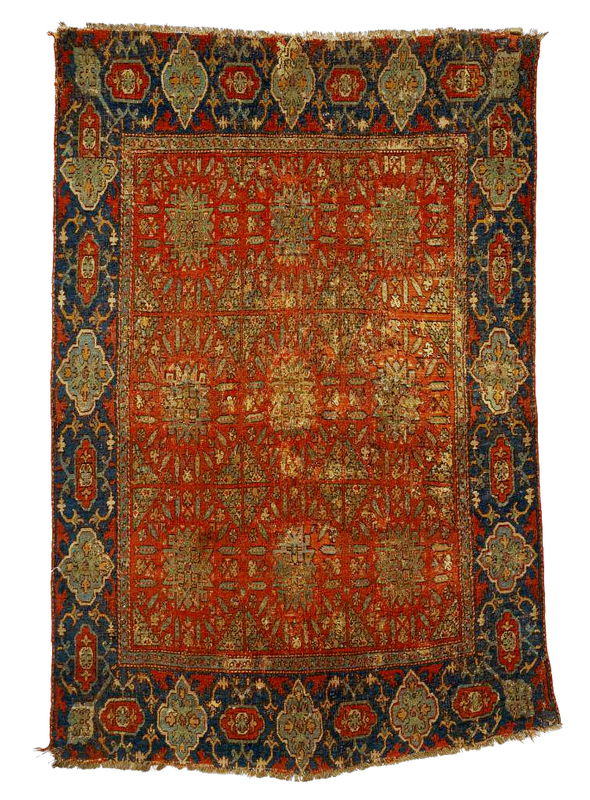 For Clark, this was a prayer rug, doubtless due to the Kibitka ornaments in the upper frieze which can also be interpreted as mihrabs-although which prayer rug ever required so many? 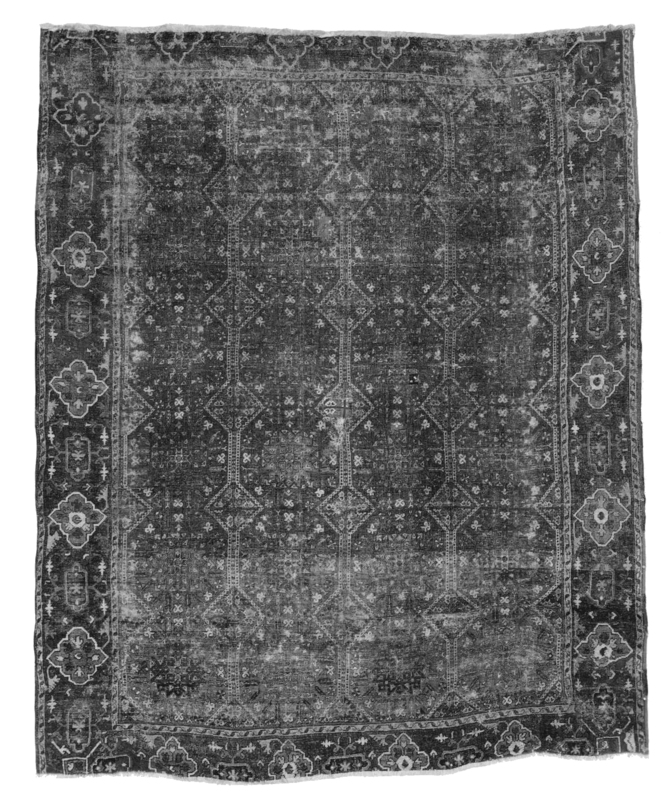 Their use as door rugs was certainly documented by early travellers to the area, principally during the Afghan Boundary Commision tour. 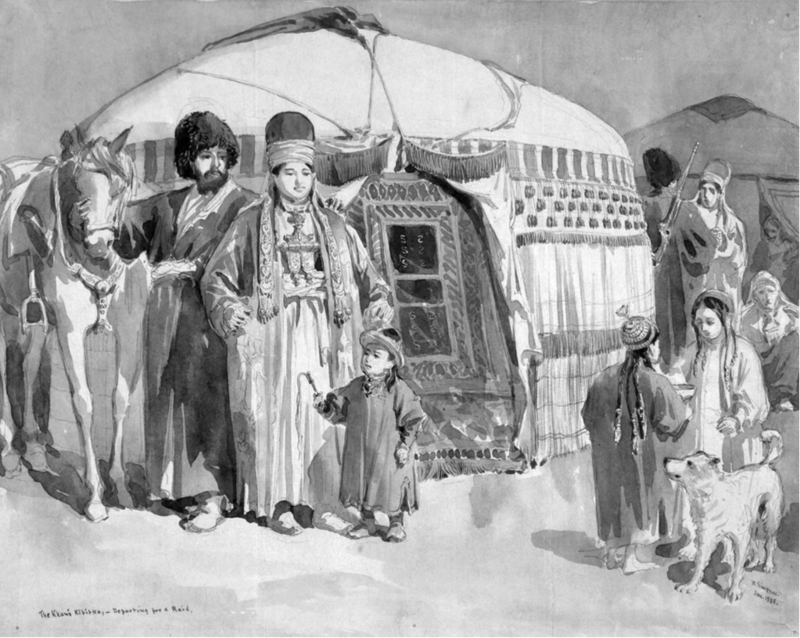 A watercolour by William Simpson from 1884 shows an Ensi thus employed, during his visit to a Saryk Khan`s Kibitka. 140 x 160 cm. 9) Sold twice at Rippon-Boswell`s; on 18 November 1995 (Lot 123) for $13,255, and again on 19 May 2001 (Lot 104) for 20,000 Deutschmark, this example appeared a third time at Henry`s in Mutterstadt on 9 June 2018 (Lot 07254) selling for just 2400 euro. Its present state of decay with faded repair was no doubt responsible for its fall from grace. 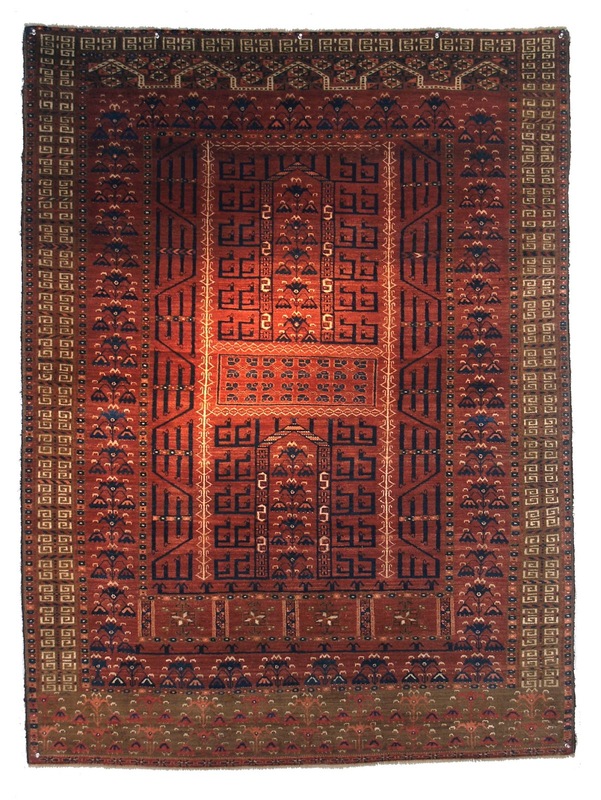 Appears cotton-free, coarsely knotted, and with an interesting ground-figure play in the central panel.127 x 173 cm. 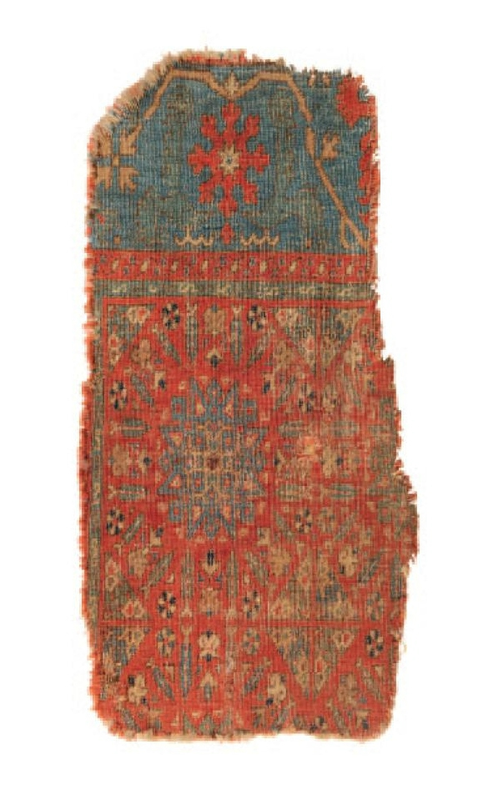 10) Offered as part of a lot of three Turkmen rugs(the others being a Tekke rug and Ensi) which were passed at Sothebys New York on June 6, 2007, for an estimate of $3,000-5,000.A curious lackadaisical finish in the upper frieze. 102 x 127 cm. 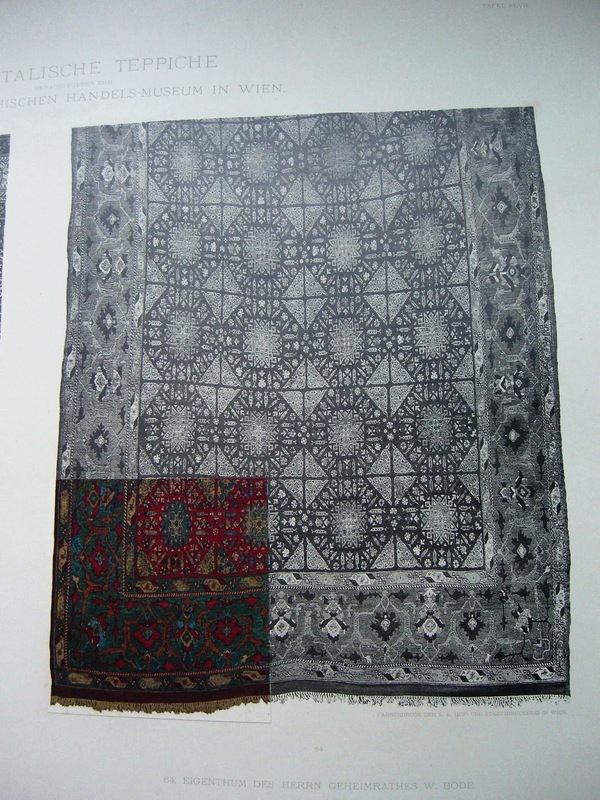 11) An early publication of a Saryk Ensi from the 1909 edition of Neugebauer & Orendi.The authors grouped three pieces together as issuing from Khiva (where carpets were hardly woven) i.e an Ersari, Saryk and Tekke Ensi. 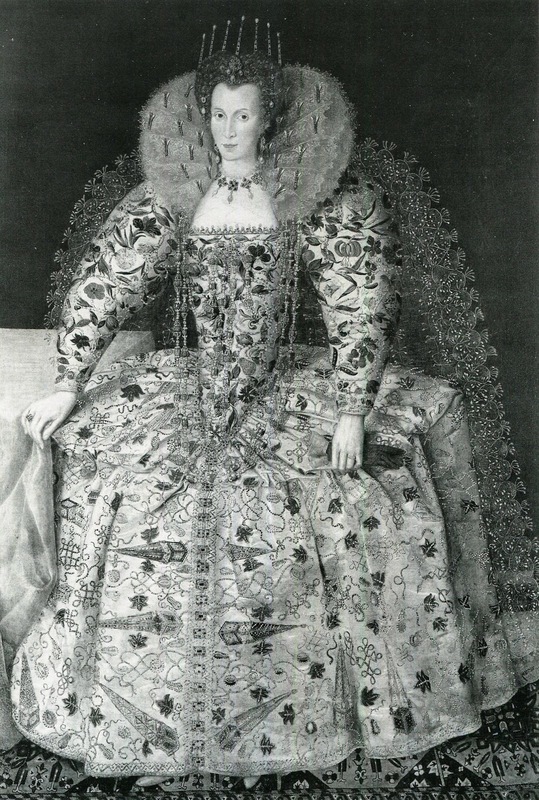 The whites are described as being frequently worked in cotton. 12)Exhibited at the Hamburg ICOC, and described in the catalogue as “incomparable”.The animal meander borders appear exaggerated next to the refined but lifeless vertical flower forms which appear lost on the field. 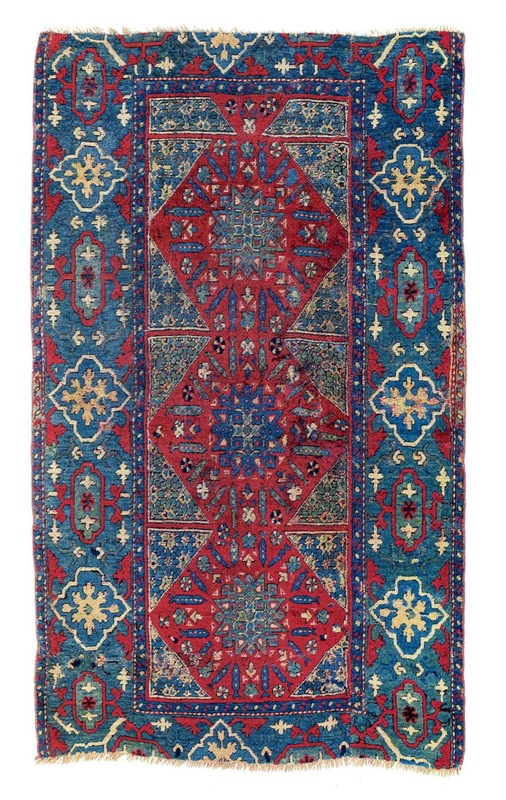 The central panel is on a blue ground as in the Fernandes rug(Fig 1) and the Elem panels are also in the same style. 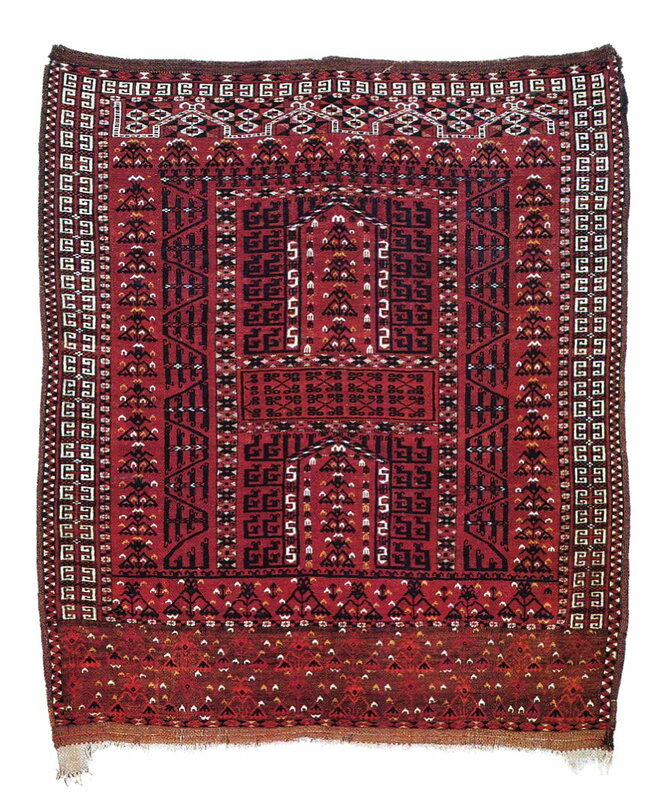 Both pieces also employ the Peikam minor border surrounding the central panel. Thompson dismissed the 17th-18th century dating. 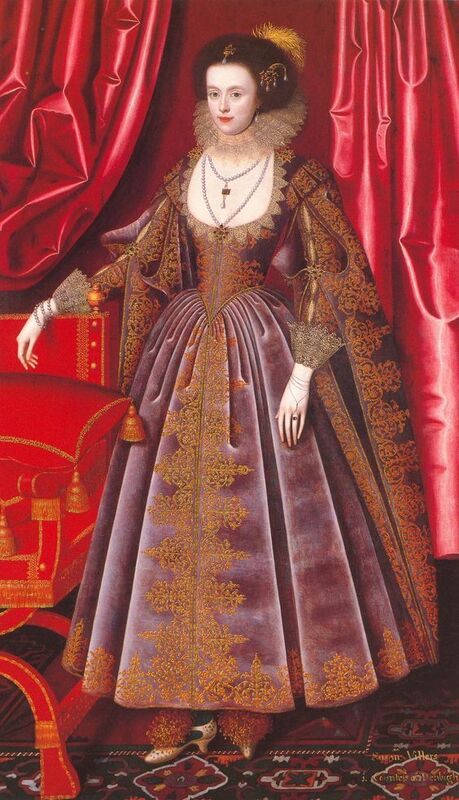 Use of cotton and silk. 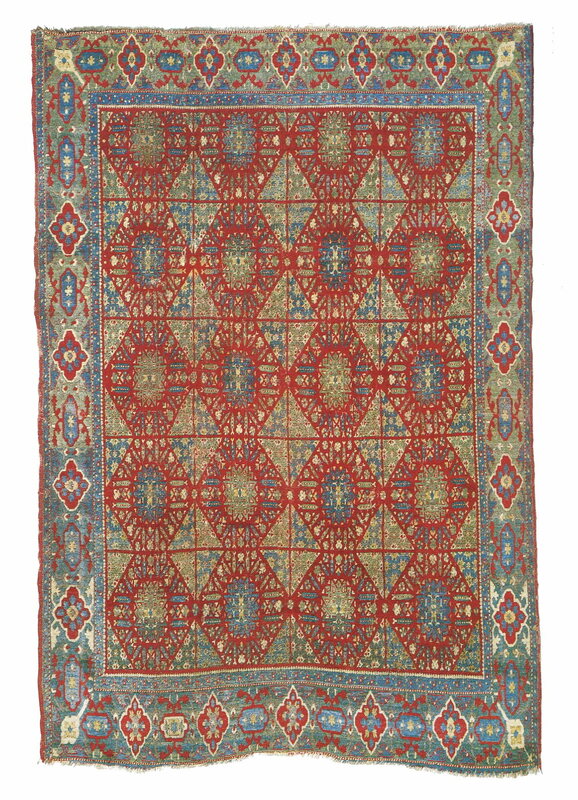 120 x 177 cm. 13) Clearly related to the previous example but lacking its strained elegance. The Sainak border and other white areas are surely knotted in cotton. The whole has a more rustic approach, which is not unappealing. 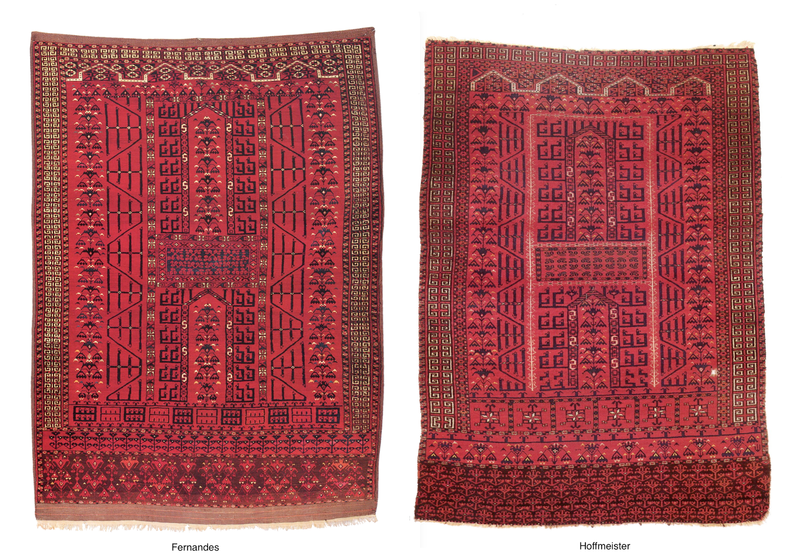 Published in Woven Stars, Raymond Benardout,1996-Rugs from Southern Californian Collections, plate 60. 16) Published by Gröte-Hasenbalg in 1922, and attributed to the Pende Oasis. 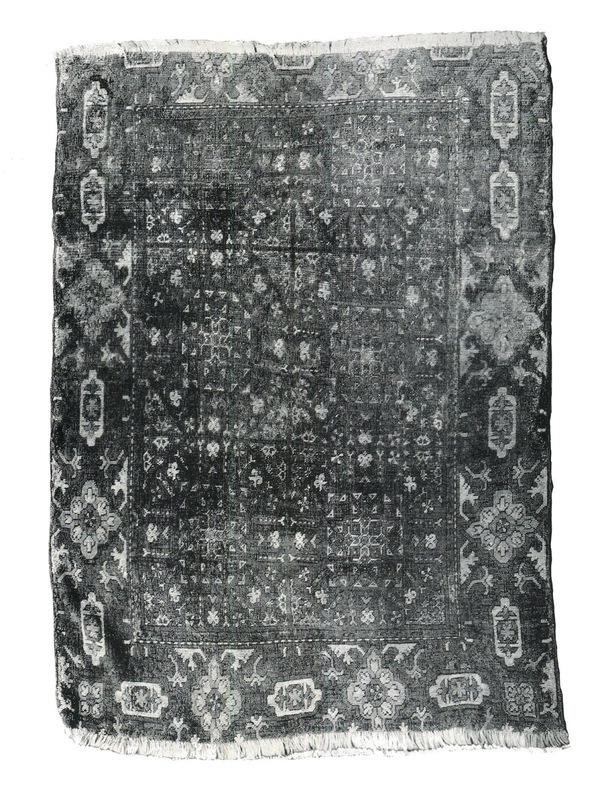 The author seemed not to distinguish between this rug and a much later purple model (his plate 86) Both are described as “Kisil-Ayak” The absence of cotton is noted, however. 128 x 140 cm. 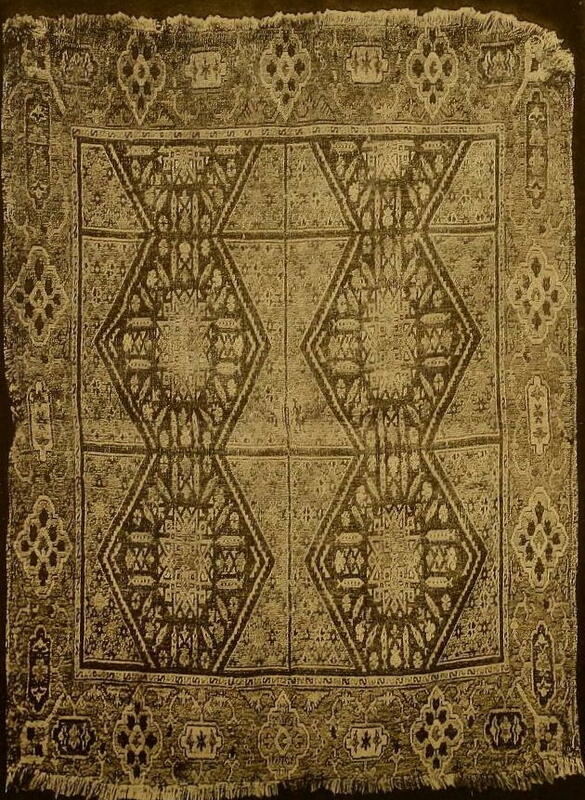 17) Once with Jeffrey Bushman on ebay, this rug later surfaced with Rippon-Boswell on 31 May 2014 (Lot 174) and was auctioned for $26,575.Elegant and in very good condition: Hali noted: “clear whites that may contain cotton”(Hali 181-127) and dated it to the early 19th century. 127 x 161 cm. 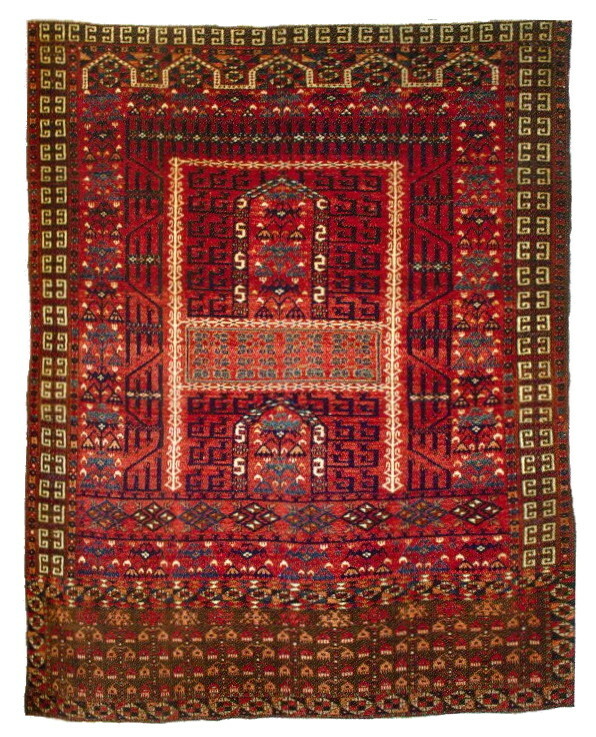 18)Another Rippon-Boswell item which sold for $26,720 on 20 November 2004 to Claudia Pavignano.In pristine condition and featuring an unusual inner star border. 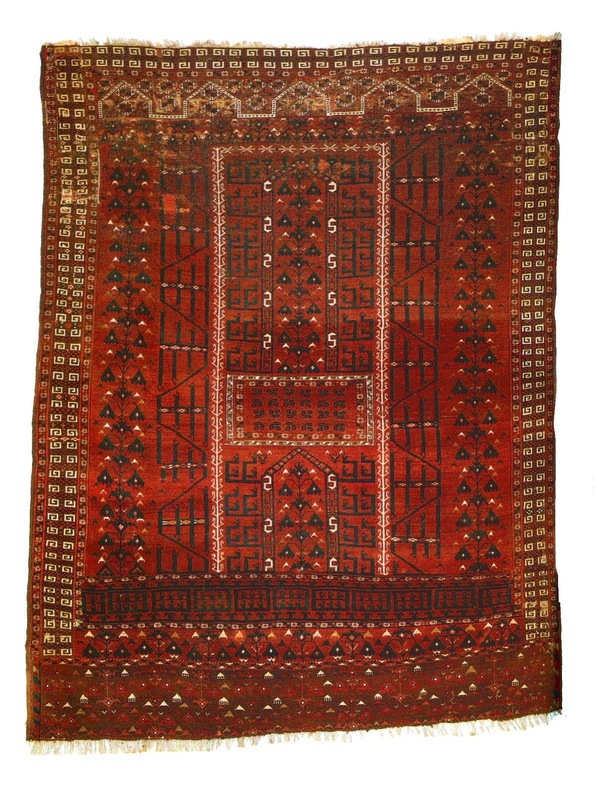 136 x 177 cm. 19)A damaged but still very animated example from the Hoffmeister Collection which in many ways recalls the Gröte-Hasenbalg piece, albeit superior. 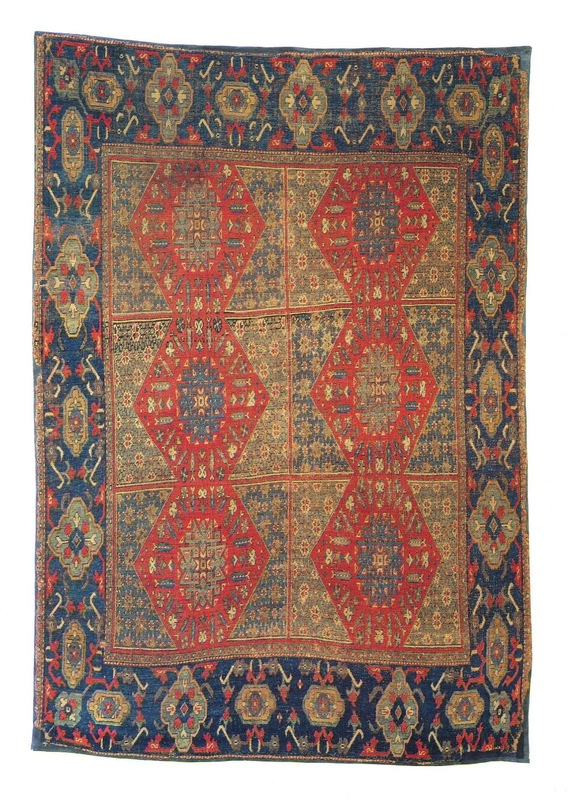 117 x 152 cm. 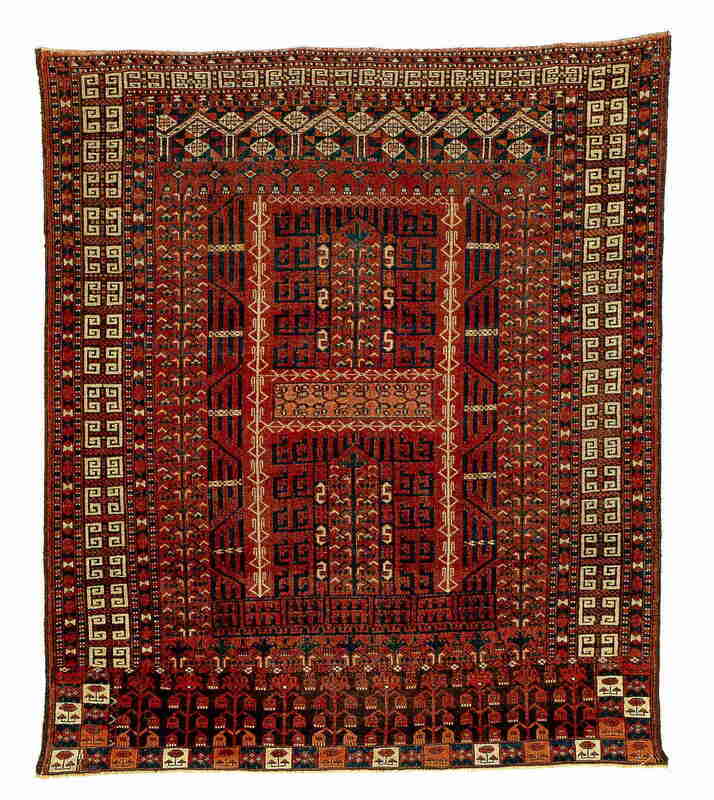 20) An icon of Turkmen art, this was top-seller at the Thompson Sale, Christies 16 December 1993 (Lot 23) It was purchased by Eberhart Herrmann for $57,000, and is now a highlight of the Hoffmeister Collection.it is one of the few examples which can stand comparison to the Salor models. Nothing negative can be said about it, although the Elem could be construed as elementary. But it heralds in a great drama and is suitably decorous. 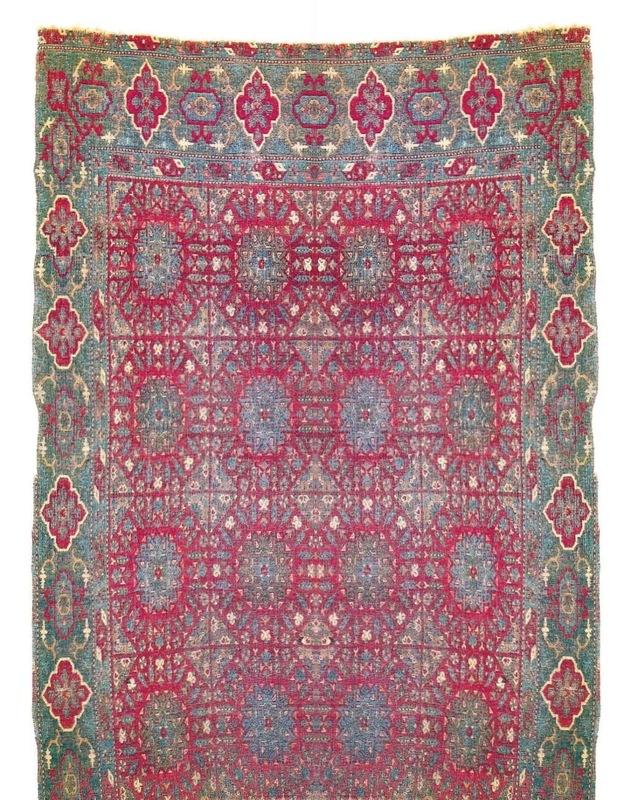 130 x 180 cm. 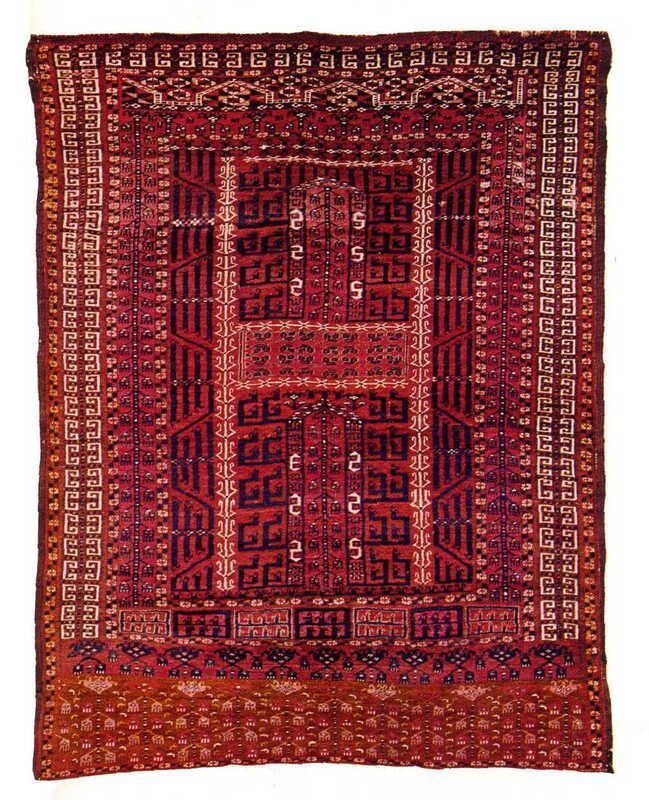 21) Chosen by Jon Thompson for the “Turkmen” catalogue, and of a marvellous clarity. 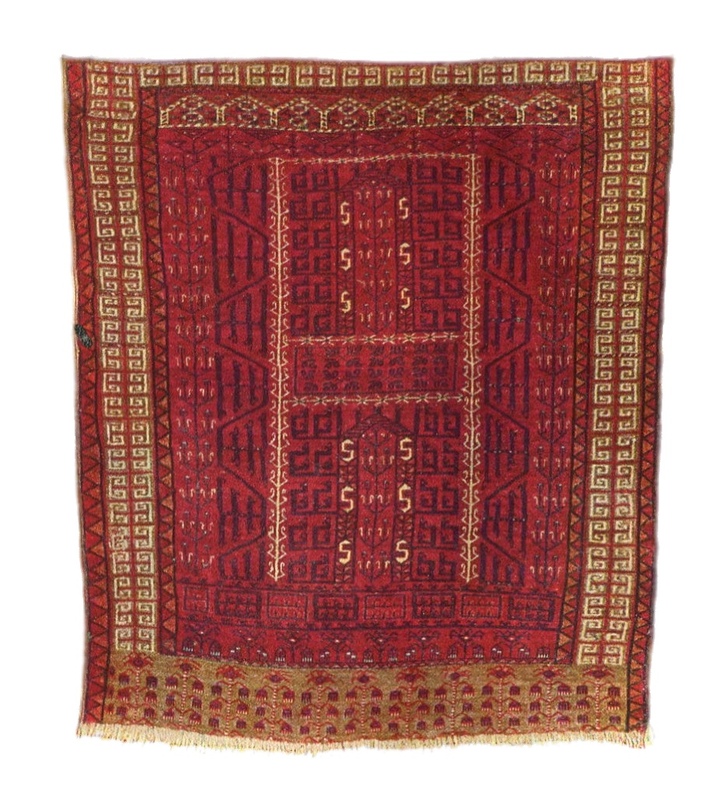 Its elongated shape was presumably made for a high door, and the weavers have solved the problem of squeezing so much ornament into an unaccustomed space adroitly. 134 x 214 cm. 22) Another choice from Jon Thompson for the Haji Baba book “Timbuktu”-Munkasci Collection. It forms a triumvirate with the preceding examples, following the same game-plan. 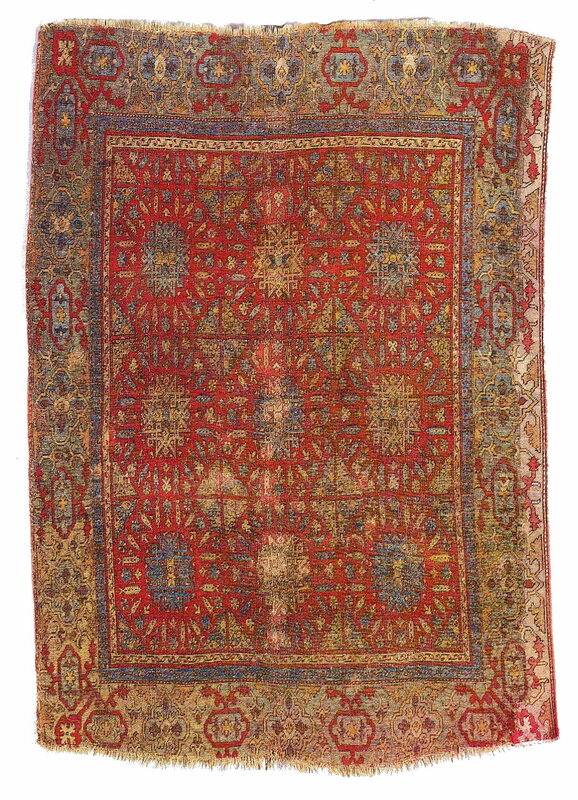 137 x 172.7 cm. 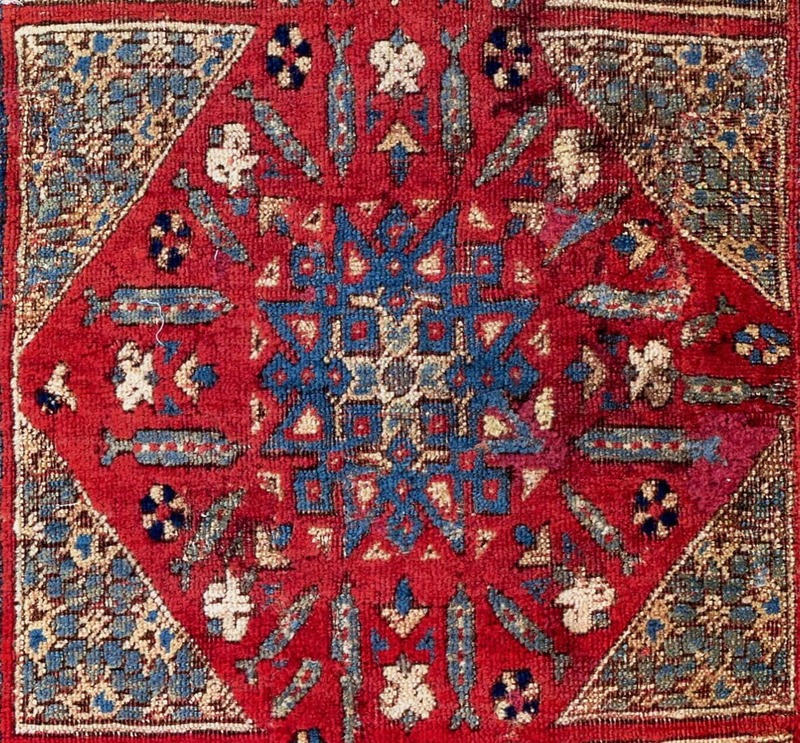 23)On the website of Mohammad Tehrani in June 2018.With an inner guard of connected stars and the addition of rams-horns topping the Kibitka, a varied and interesting rug. 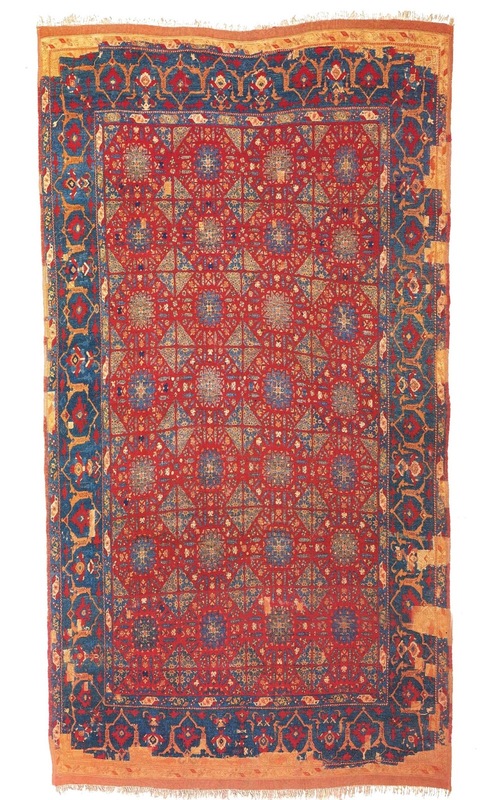 126 x 168 cm. 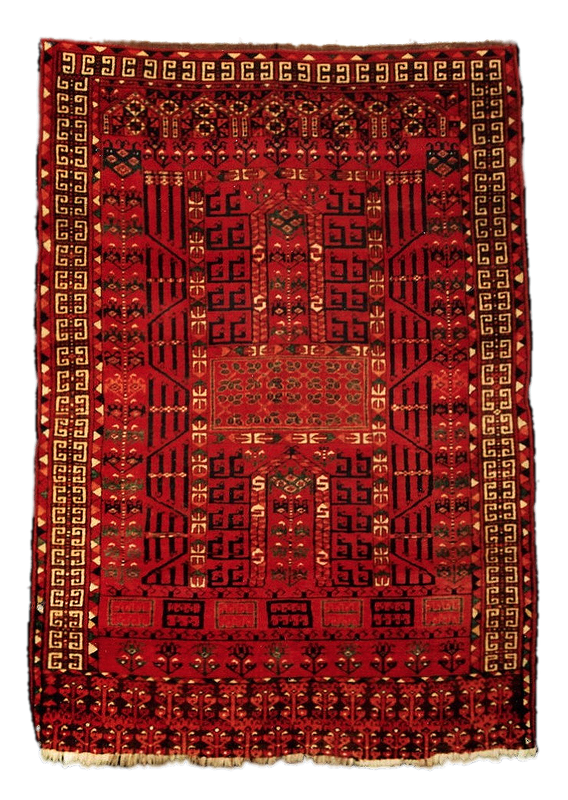 24) Published in the English-language edition of Moshkova “Carpets of the People of Central Asia”, edited by O`Bannon and Amanova-Olsen, figure 79.An asymmetric, open-left knotted rug with no cotton. 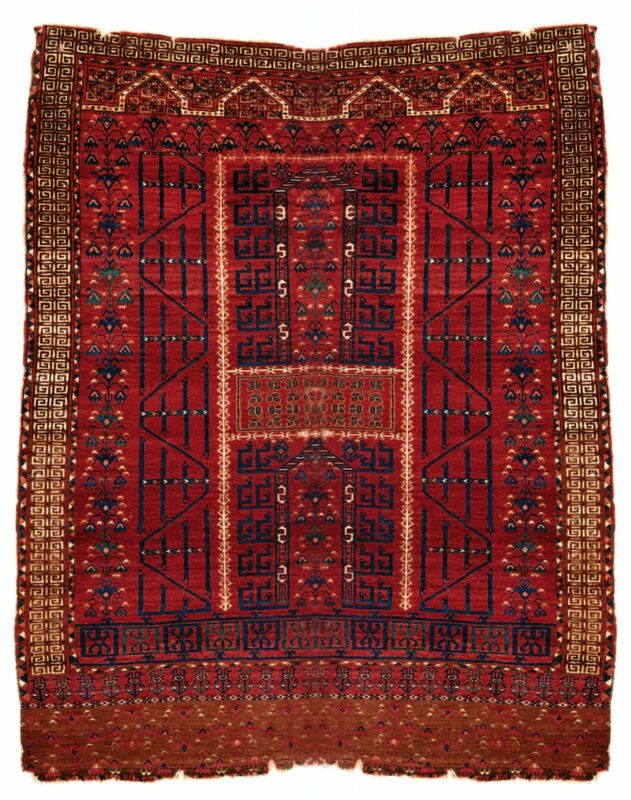 One of two Persian knotted rugs illustrated here.O`Bannon credits Moshkova with re-instating the Saryk as a major rug-producing tribe after earlier Russian authors had ignored them. 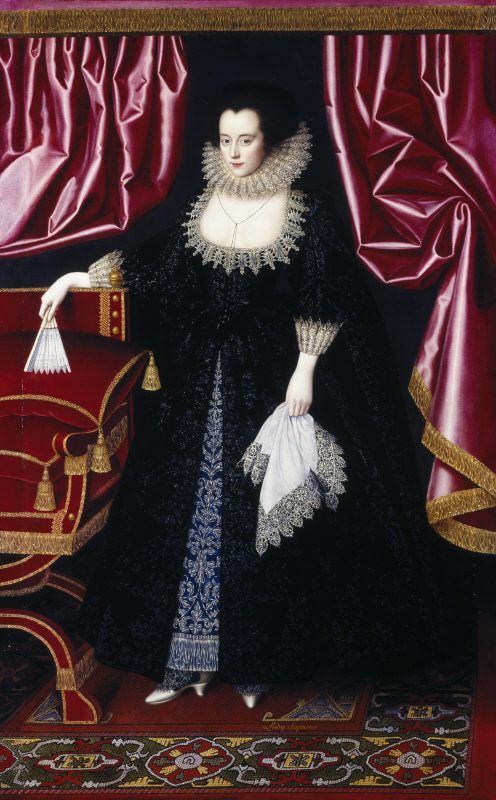 This large example seems cramped and crowded, with either poor colouring or reproduction.156 x 202 cm. 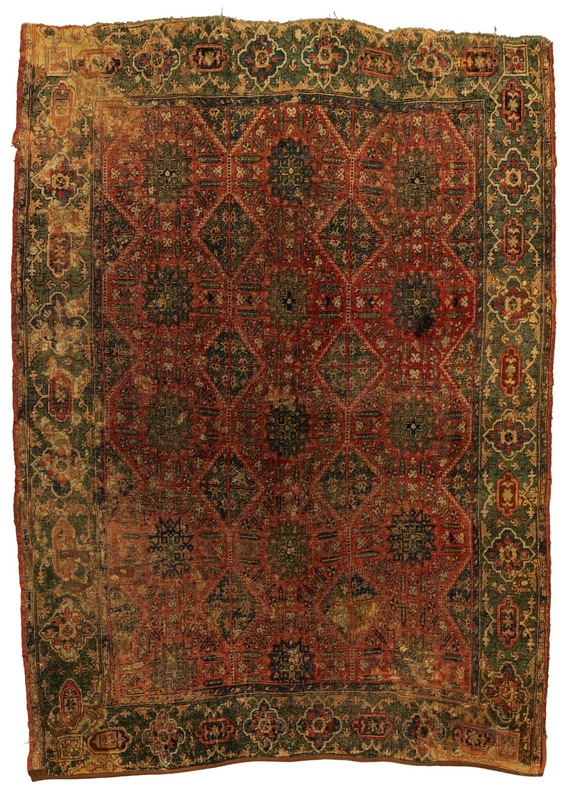 25) In design comparable to the Thompson / Hoffmeister, this elegant carpet was sold at Grogan `s, Dedham on 22 May 2011 (Lot 810A ) for $10,350.Its mahogany ground colour probably weighed against a higher price. Later seen with Tehrani, it was shown at the 33rd Turkmen Meeting in Hamburg, in 2012. 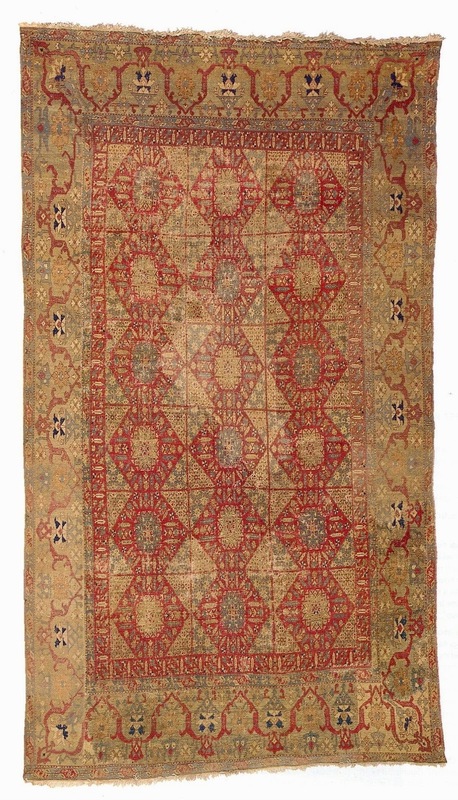 129 x 177 cm. 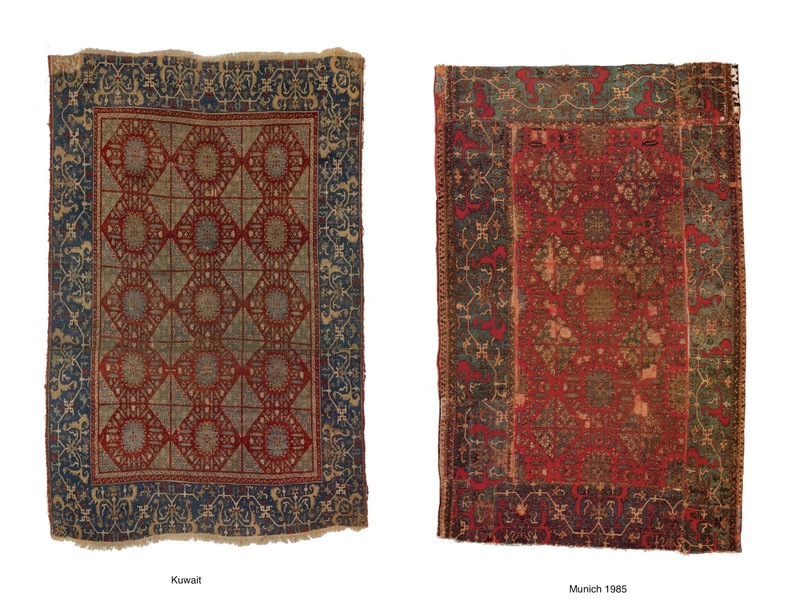 26) Published by Lerch Carpets, Munich, in Hali 186 (2015) and in Carpet Collector 2-2013, where the reproduction is radically different. A fastidiously executed member of the decorative group with unusually thick bands used in the animal-meander border.Said to be in mint condition. 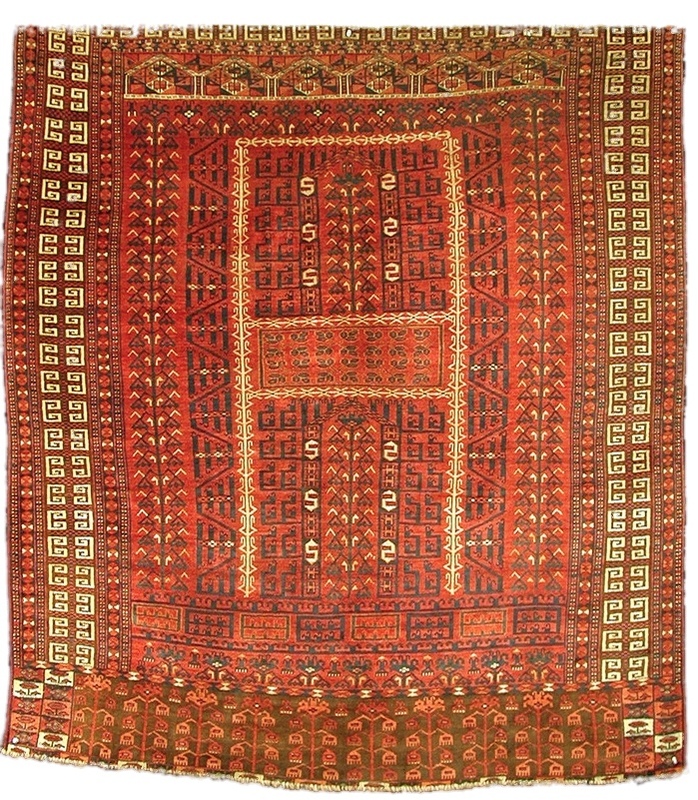 126 x 166 cm. 27) Sold at Rippon-Boswell on 7 May 1988 (Lot 63) for 38,000 Deutschmark. Well drawn field with a top row of soldierly figures to complete the animal-meander border. 138 x 172 cm. 28)Another Rippon-Boswell sale on 18 November 2000 (Lot 130) for 82,600 DM ($36,390)First published in Herrmann, Uschak bis Yarkand, plate 94. As in the previous item, the meander border closes at the top. 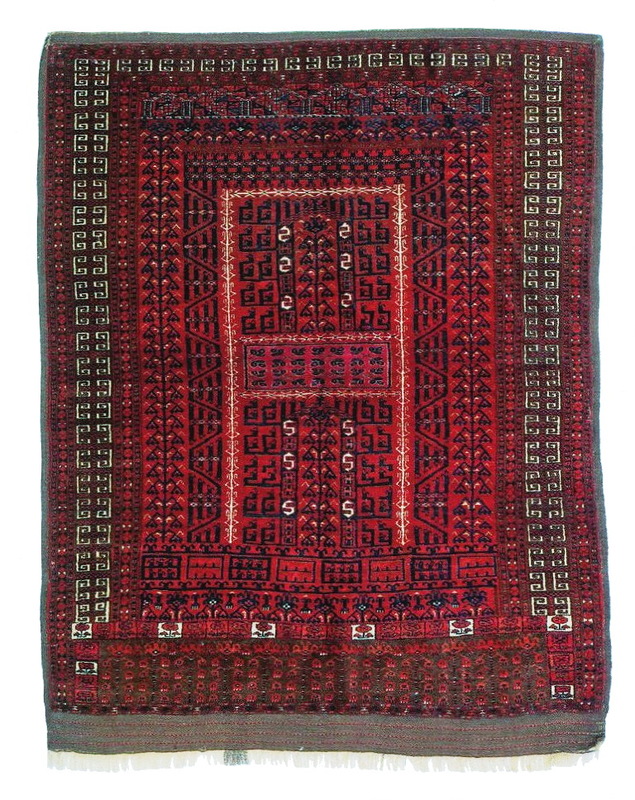 142 x 189 cm. 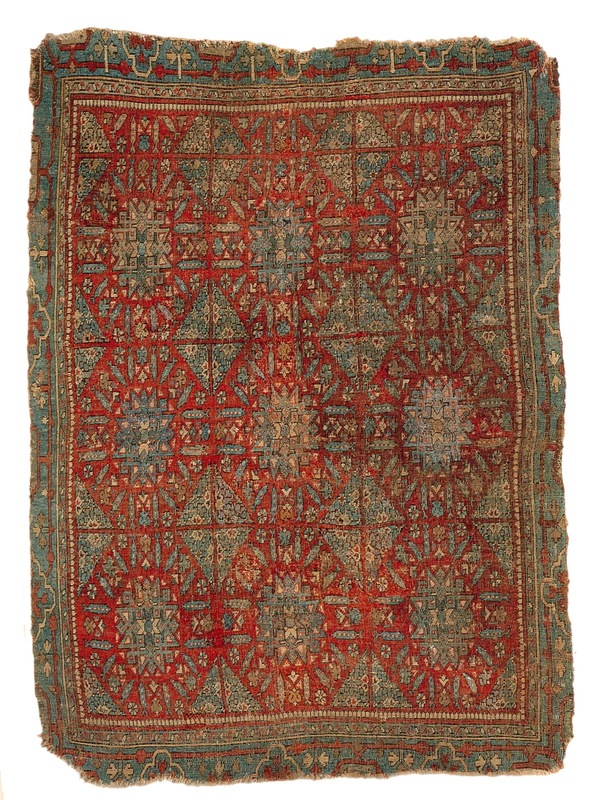 29) Shown during the Milan ICOC exhibition “The Turkmen Wedding”, from the collection of the Russian State Museum in St.Peterburg.A carpet with wool and silk, employing extensive off-set knotting. 146 x 172 cm. 31) Another piece from the Milan show, featuring dyed cotton in the pile. 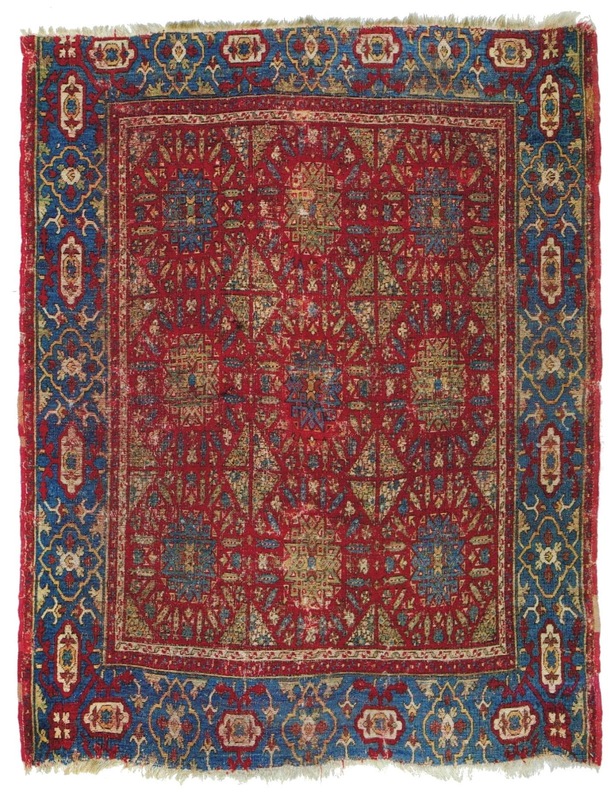 Purchased by Burdakov in Pendeh,1903, as “manufacture of the Saryk Turkmen”.Russian State Museum, St. Petersburg. 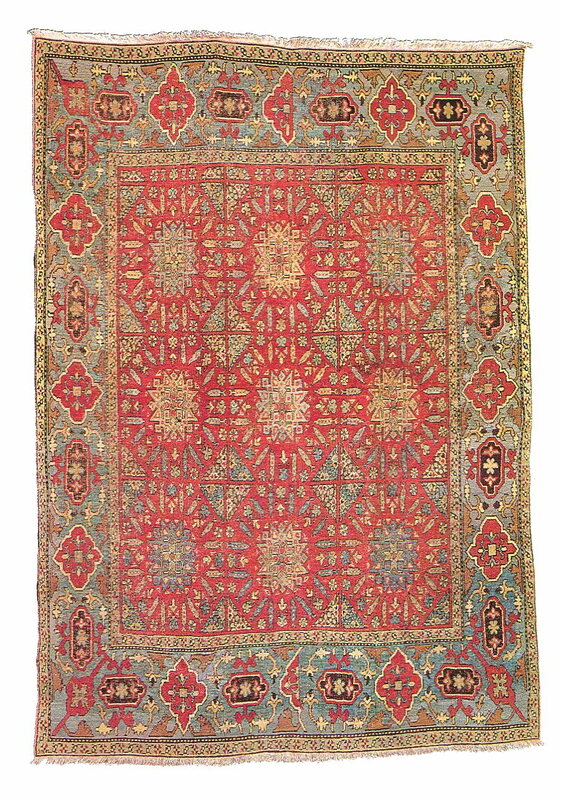 112.5 x 163 cm. 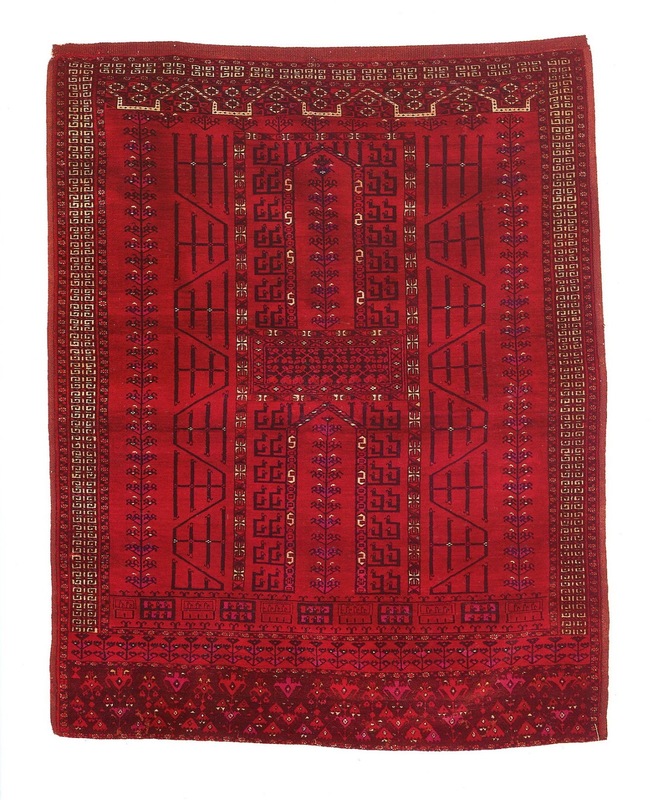 32) Inexplicably described as an earlier example from the Merv Oasis with a rich mid-red ground colour (Hali 2-4-1980, page 304) It entered the Victoria & Albert Museum in 1923 (T-191-1923)A large example. 136 x 196 cm. These rugs utilise a drooping-style vertical flower border derived from a simplified Elem design. 33) Not quite fitting but placed here for expediency, Hans Sienknecht`s outstanding example is actually too good for the rest of this group, with its Peikam inner border and deftly placed single flowers. Two unusual forms can be seen top left and right of the rising flower border, whose rhythm is also interrupted half-way.130 x 170 cm. 36) Lefevre November 1982 (Lot 35)Sold for 7,500 GBP. Cotton and silk.144 x 172 cm. 37) Lefevre 4 March 1983 (Lot 10) Sold for 9000 GBP.White cotton.139 x 180 cm. The last group recorded here all insert small boxes into the Elem panel, with flowers and other designs. 38) Sold at Robert Aldred 15/16 May 1981 (Lot 756) for $3,100. 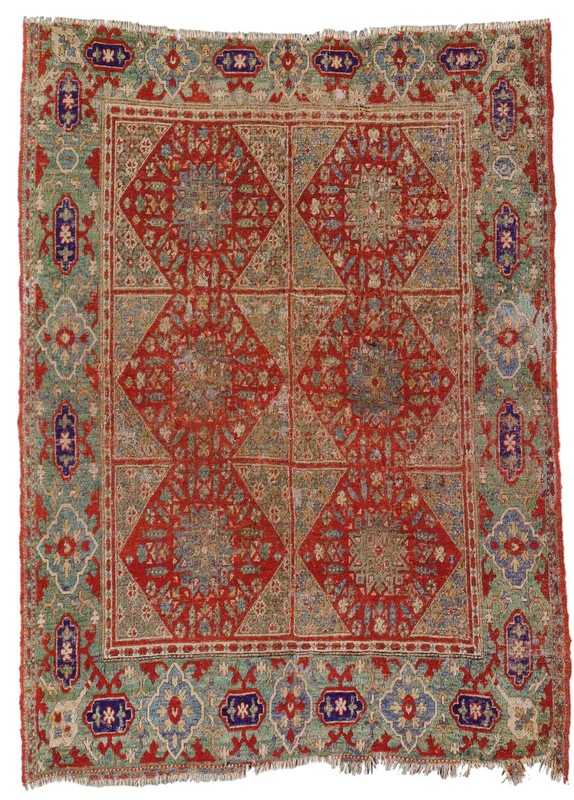 150 x 183 cm. 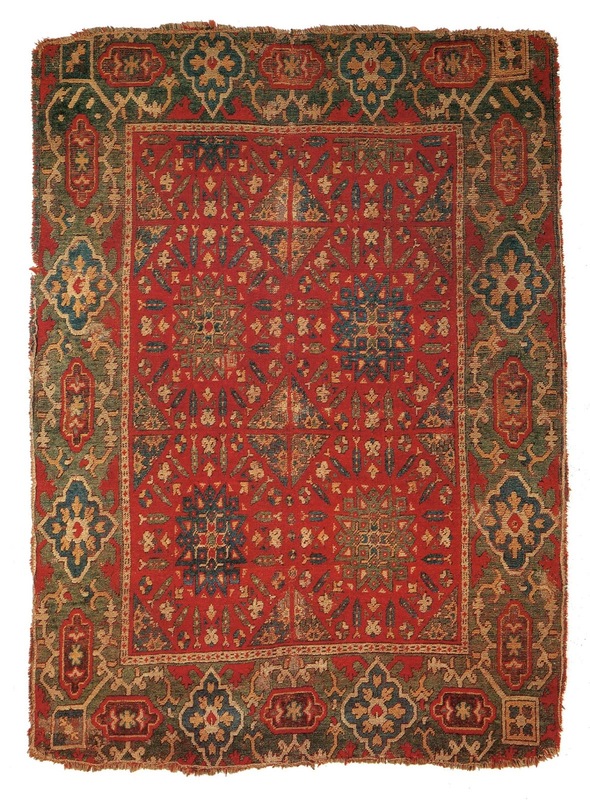 39) A superior example published in Lefevre, Central Asian Carpets,8 October 1976, plate 8.Cotton and silk.137 x 195 cm. 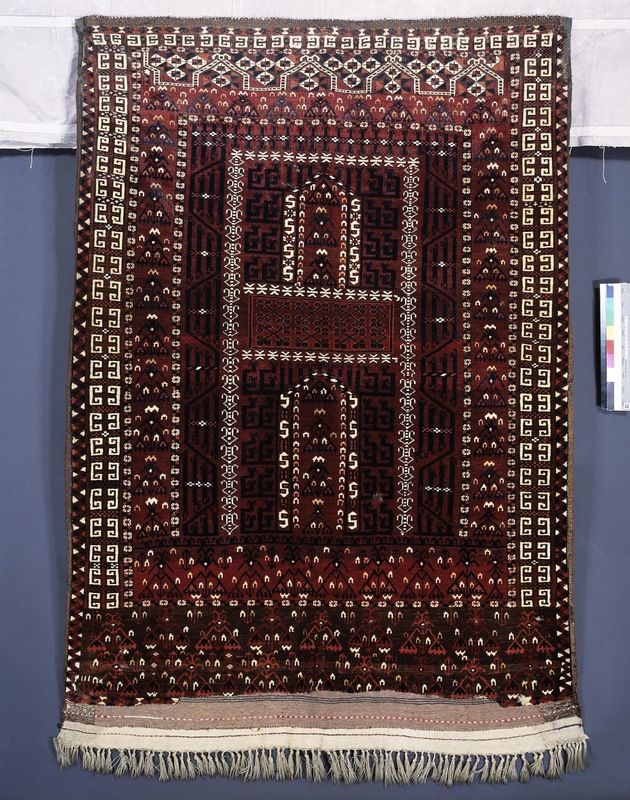 40) At Rippon Boswell on 31 May 2014 (Lot 12)Failing to attract a bid at 5400€, it reappeared the following year on 13 June 2015 and was sold for 2928 euro. A disturbing abrash runs half-way through the border. No cotton or silk. As with most of this group, a multi-blossom tree has been employed. Its square shape is unusual.151 x 168 cms. 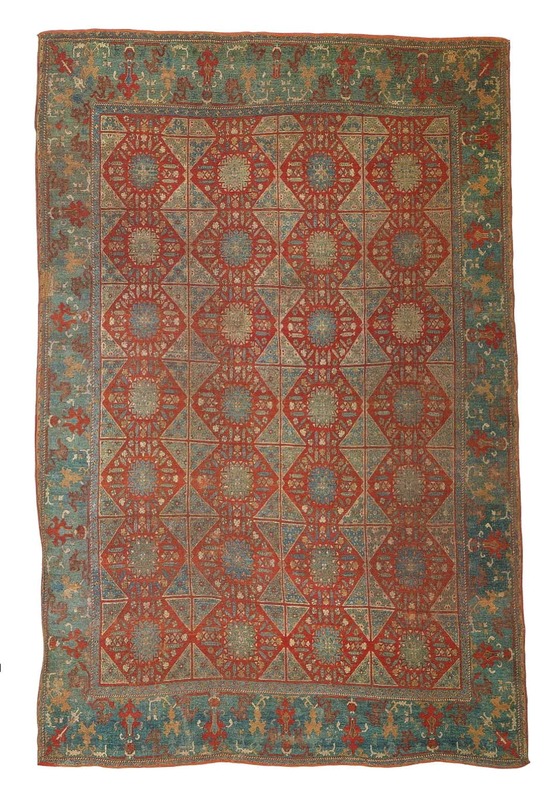 41) Published in Adil Besim, “Mythos und Mystik” 1-70.Another square-shaped rug with multiple blossom tree-of-life.132 x 154 cm. 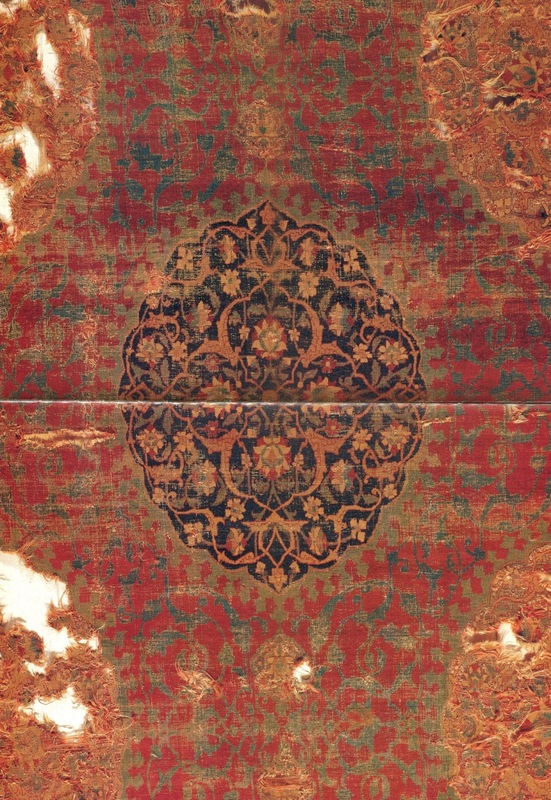 43) With Serkan Sari.Published Carpet Collector 3/2014 page 29.149 x 187 cm. 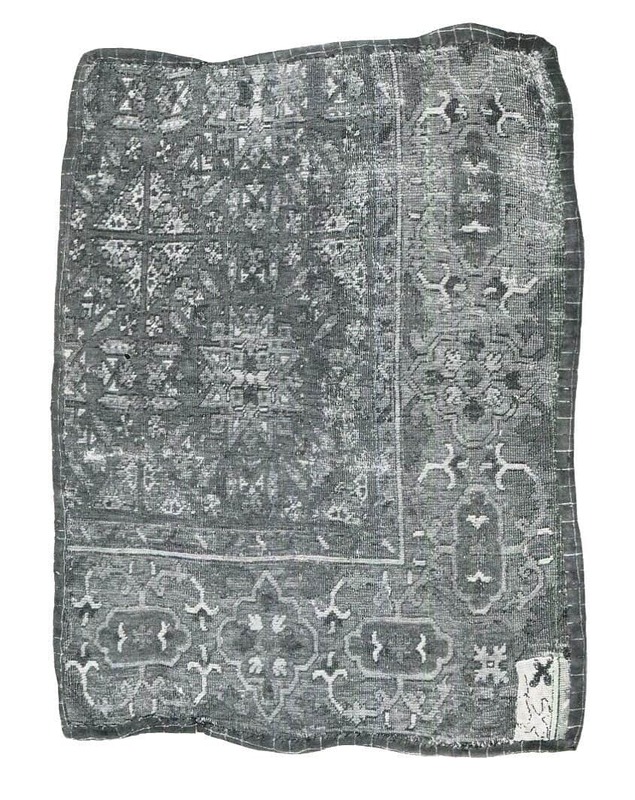 44) From the Bogolyubov Collection, Russian Ethnographic Museum, St.Petersburg.Published in Bogolyubov, Carpets of Central Asia, plate 4 (Crosby / Thompson)Likely to be the first published example. 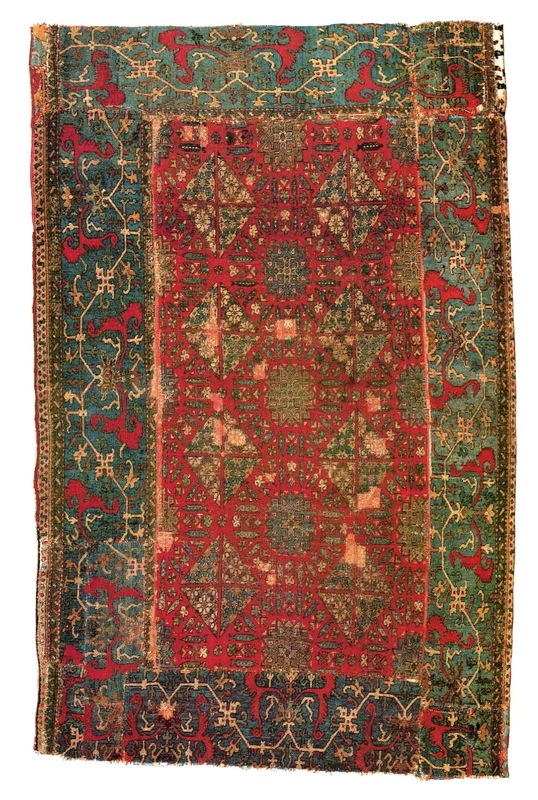 Said to have been purchased in a Saryk settlement at Pendeh, where it is said to have been used as a door-cover. 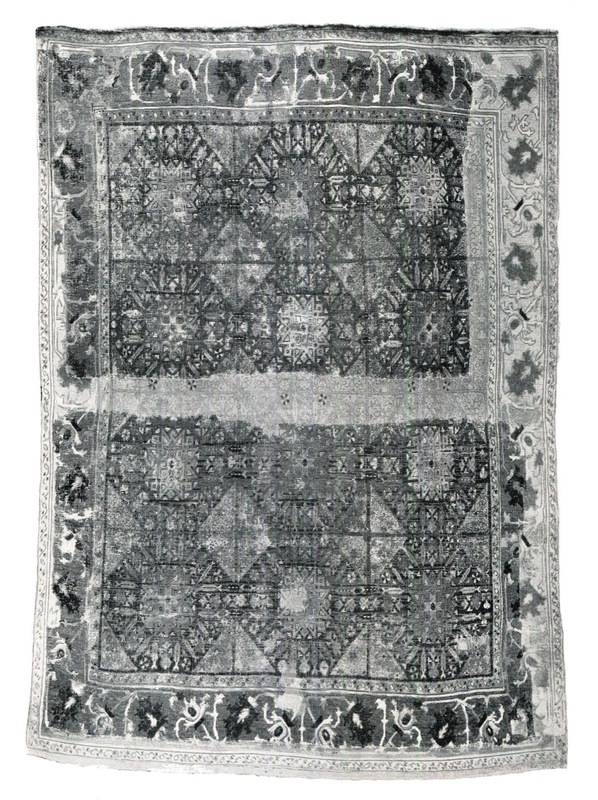 Believed by Bogolubov to have been a prayer rug. In suspiciously good condition. Probably contains cotton pile. Combination of Groups A + B. 137 x 195 cm. 45) Published by Dieter Schletzer in Weltkunst,15 April 1975; later Werner Loges collection, published in Turkmenische Teppiche, plate 26. In an early style, but exaggerated animal meander border. With cotton, but no silk. 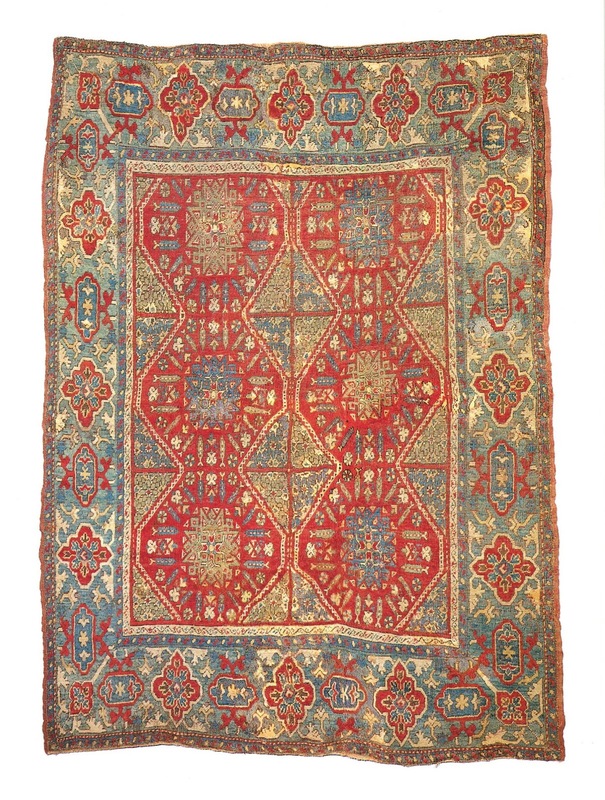 152 x 168 cm. 46) White cotton, asymmetric knot open right. Restored by the author, London 1978. The third group of carpets in the East Mediterranean group appear in paintings between the late 16th and late 17th centuries. 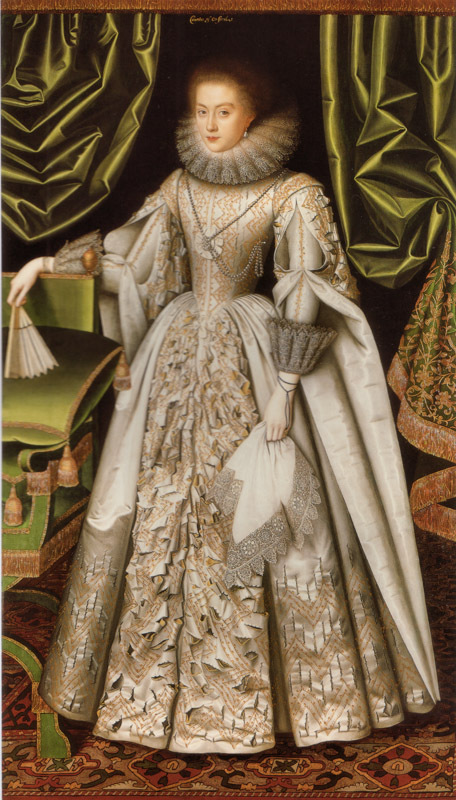 Marcus Gheeraets` portrait of Queen Elisabeth I,painted after 1570,might even show a carpet appropriated from Cardinal Wolsey,if such carpets were already being made at the beginning of the 16th century. 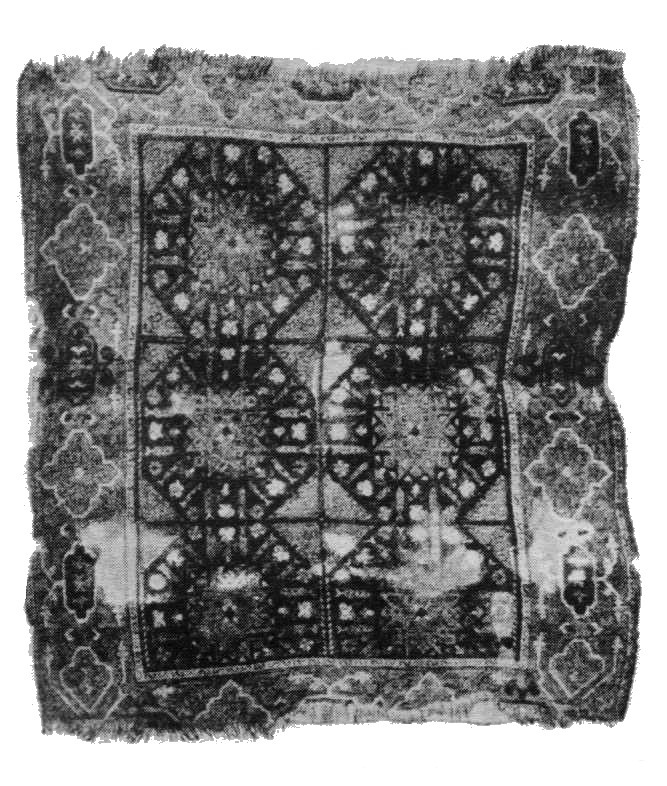 Said to be the earliest depiction of a Chessboard carpet,"The Circumcision" from Marco dall `Angelo,1586. 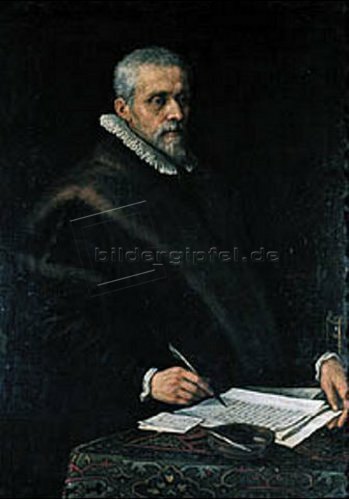 Leandro Bassano,portrait of Leonard Herman,1595. 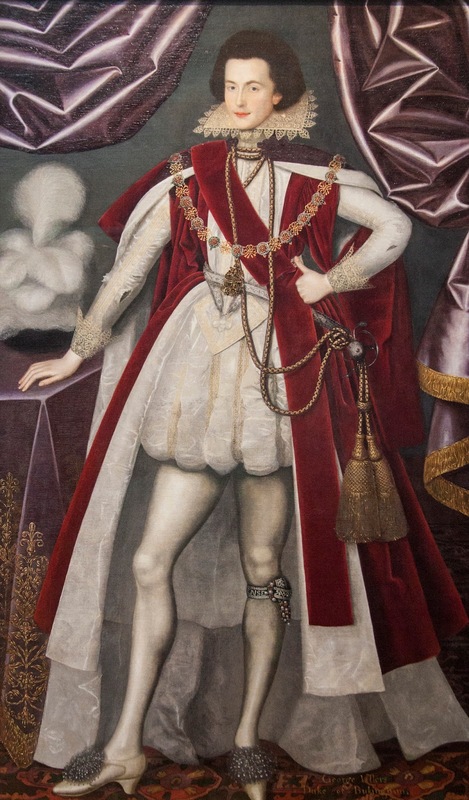 Selected portraits by the re-discovered British painter Larkin,from 1615-16. 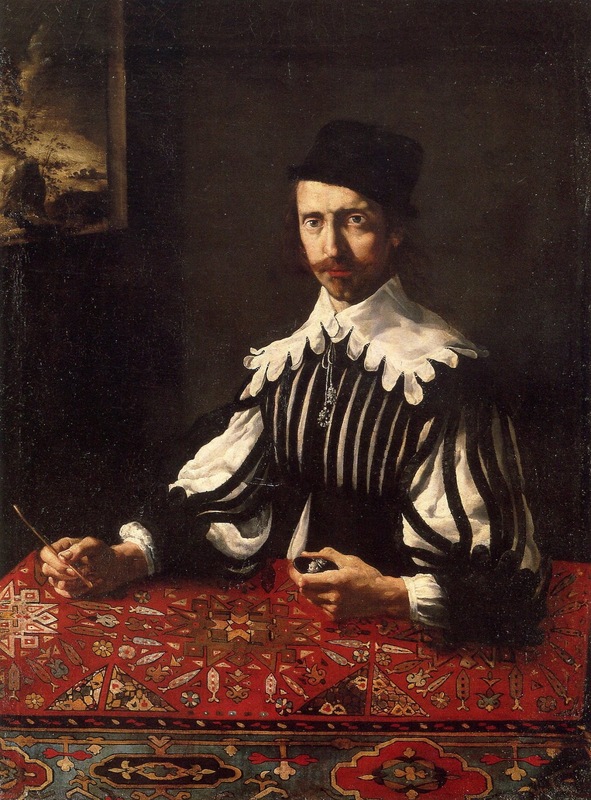 Another self-portrait,by Pietro Paolini,around 1650. 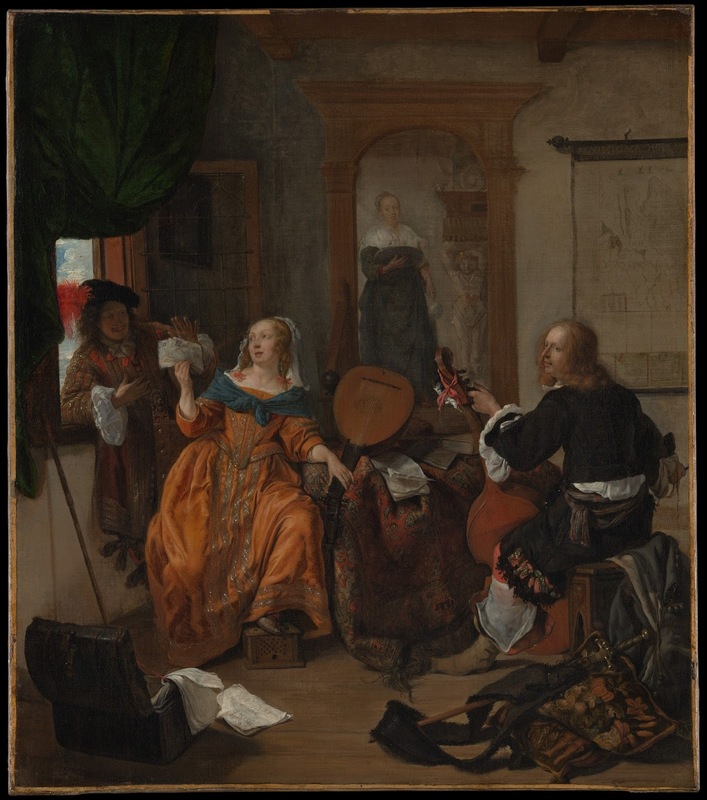 Gabriel Metsu`s "Music Party"now in the MET,from 1659. 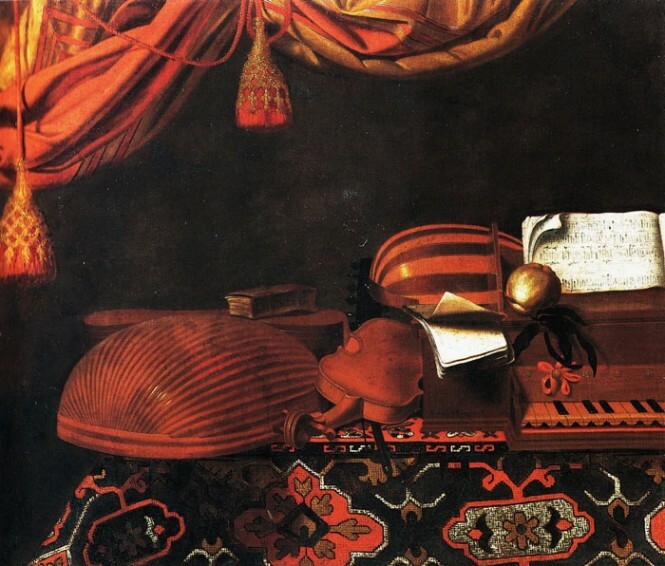 Evarista Bascheni,Musical Instruments.From around 1660-70. 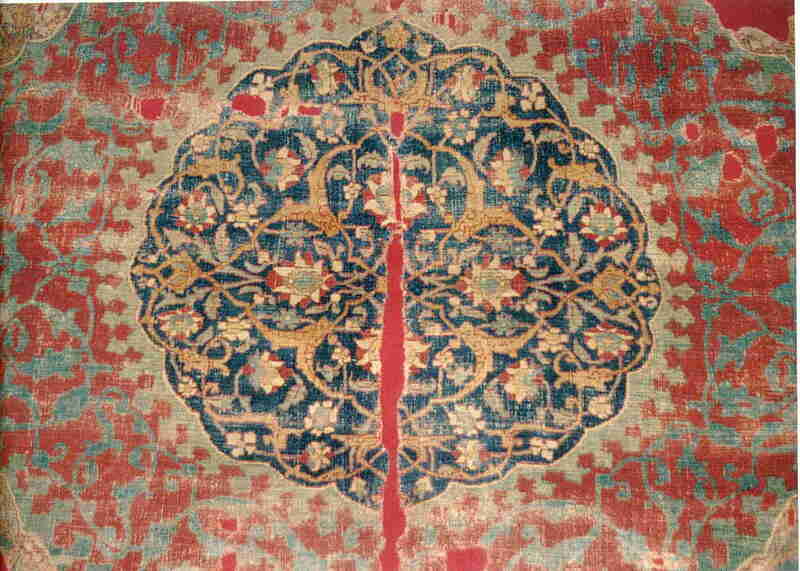 A basic design of plaited stars encircled by Mamluk tree and flower "darts" was produced in two qualities:a large scale model employing hexagons to produce a simultaneous effect,and an allover octagonal form more reminiscent of an infinite Turkmen repeat.The Hexagonal form-Type A- appears strictly connected,whereas the Octagonal group-Type B-is free-floating. In both types the cartouche-medallion border predominates.It is a kind of satirical version of the Mamluk style,with the proportions reversed:here the medallions are larger than the cartouches.Some wild arabesque borders were also invented,or possibly taken over from Anatolian models.Disparate models were also on offer,as will be shown later.Again,we are dealing with Persian knotted Anatolian rugs,which often attempted to ape the more classical styles,both Iranian and Turkish.The structure is more uniform than the para-Mamluks,employing asymmetric Persian knots open to the left,white woolen 2-ply warp and wefts dyed pink to red with two shoots.The wool is Z spun.The overall production is as consequent as the Mamluk,with virtually no technical diversity. We begin with the Type A,hexagonal-connected,or hour-glass style.Arabesque border. 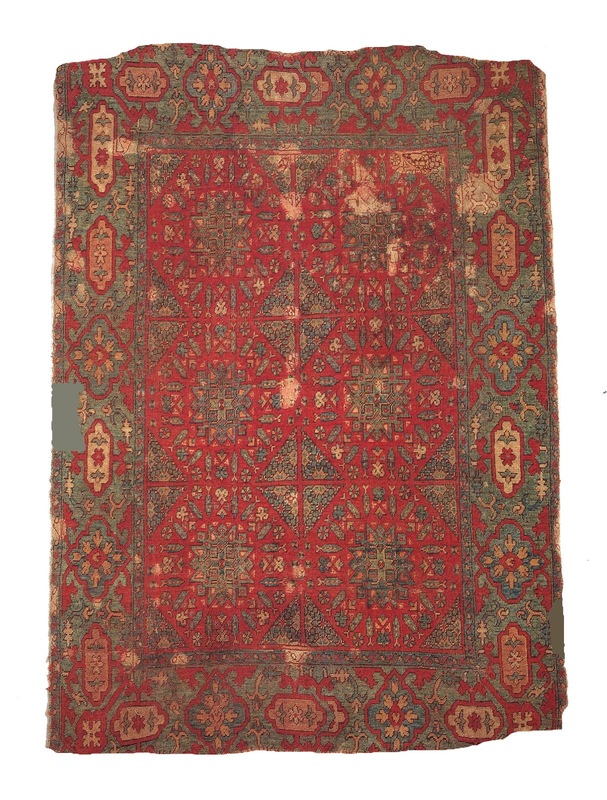 First published by LaScala in 1908 when it was then in the van Loo collection,this was auctioned at Christies on 17 October 1996(Lot 417) for a record price of $419,490.One of the most compellingly drawn of all Chessboard carpets.The border is clearly bespoke,and was copied in a more dishevelled fashion,ultimately ending its days in a schematic form on certain Lotto rugs.Now in Kuwait. 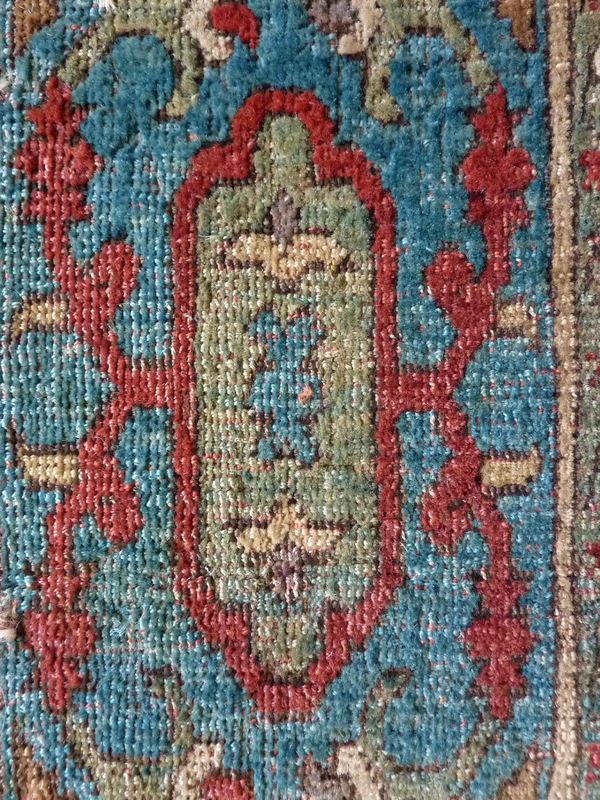 Acquired by G.H myers in 1927, the largest of this group.The border represents a further abstraction.The carpet seems more colourful. From the Bardini Collection,a small version with crudely drawn borders.Due to the separated diaper forms,this should be considered a transitional piece between the A and B groups. 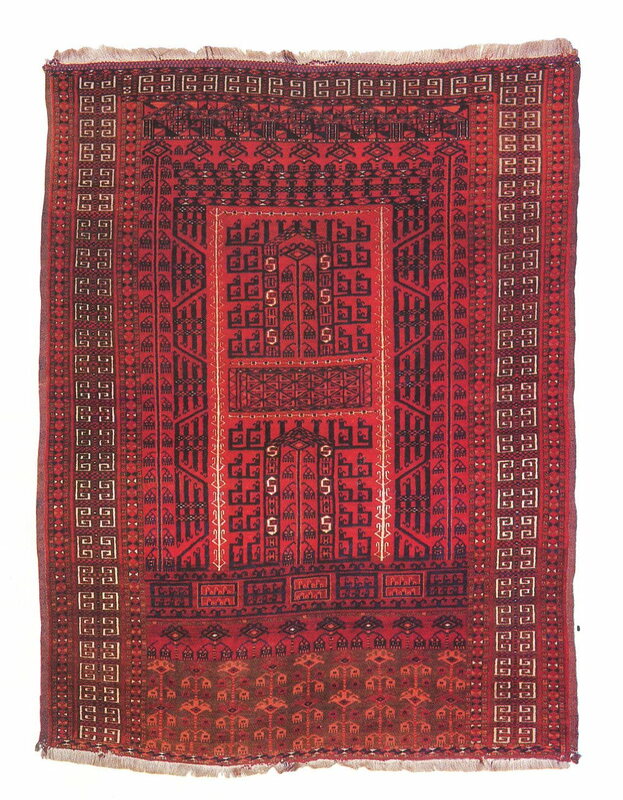 From the Pharaon Collection and published in the Sursock Museum catalogue,this first sold at Christies London on 11 October 1990 (Lot 17) for $ 68,640.It was at Sothebys in 1993 and Christies in 2001.J.P Willborg included it in his "Textile Treasures" of 1995.The impressive border is derived from Iranian Vase carpets,and encloses a Mamluk altar-flower motif. 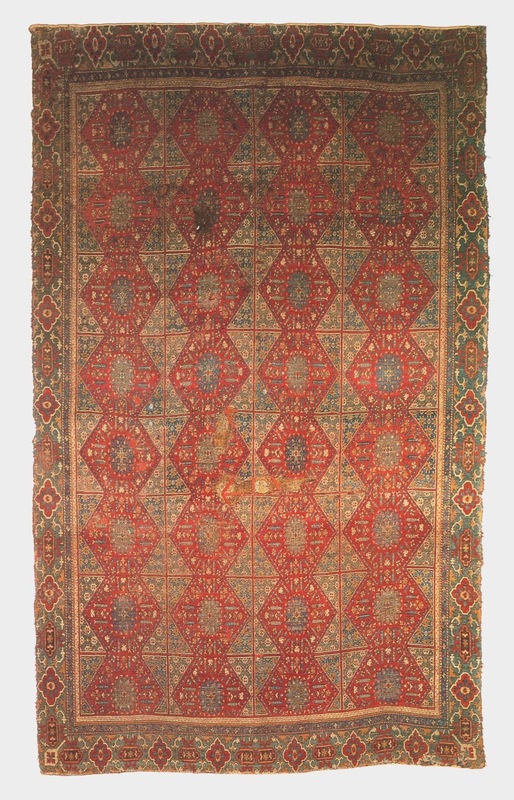 Found at Divrigi in Eastern Anatolia,this carpet shares the border of the Kuwait carpet albeit in a simplified form.Other members of the Chessboard group were sourced in Elazig,and it is possible that the area between was the birthplace of such rugs. 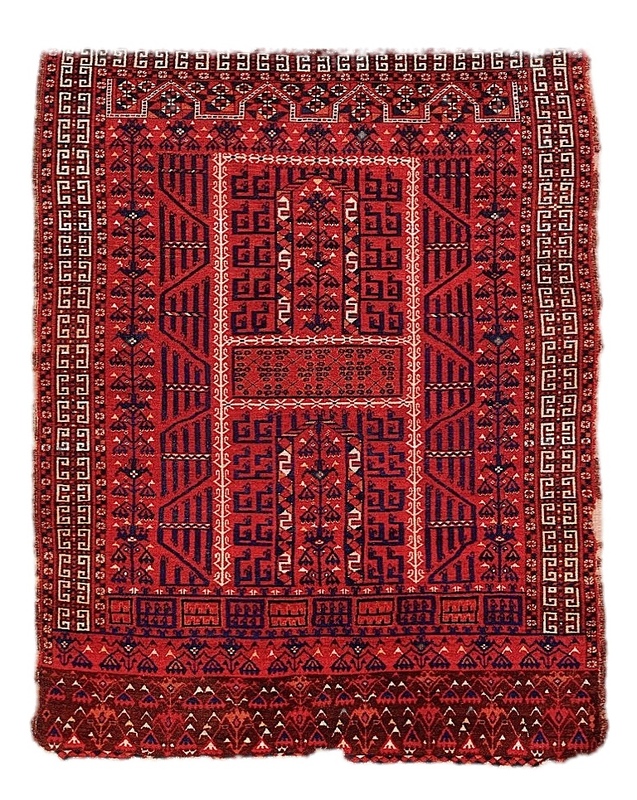 As initially mentioned this type of border has a reversed Mamluke-style border with medallion-rosettes which are more dominant than the cartouche forms between.Both components have extra arabesque appendages which serve to balance out the diminutive cartouches which are turned on their axis at the top and bottom borders.Only two large carpets in the A-type group are known with this more common border. 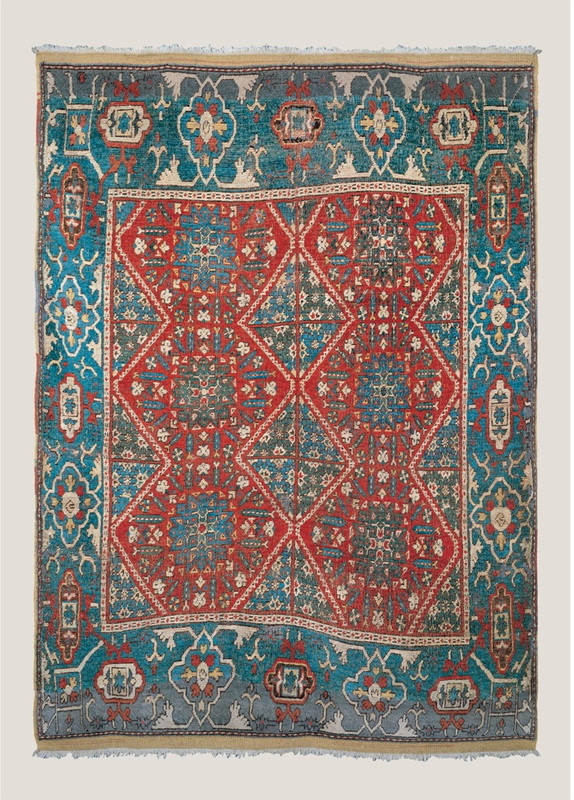 A world-record price at Nagels in 1991,this carpet,now in the Zaleski Collection,sold for $339,250 to a "well-known Italian" dealer.The author`s catalogue notes Sorgato,but it was later seen with both Mirzakhanian and Tabibnia.A beautiful carpet in good condition with accurately turned corners. 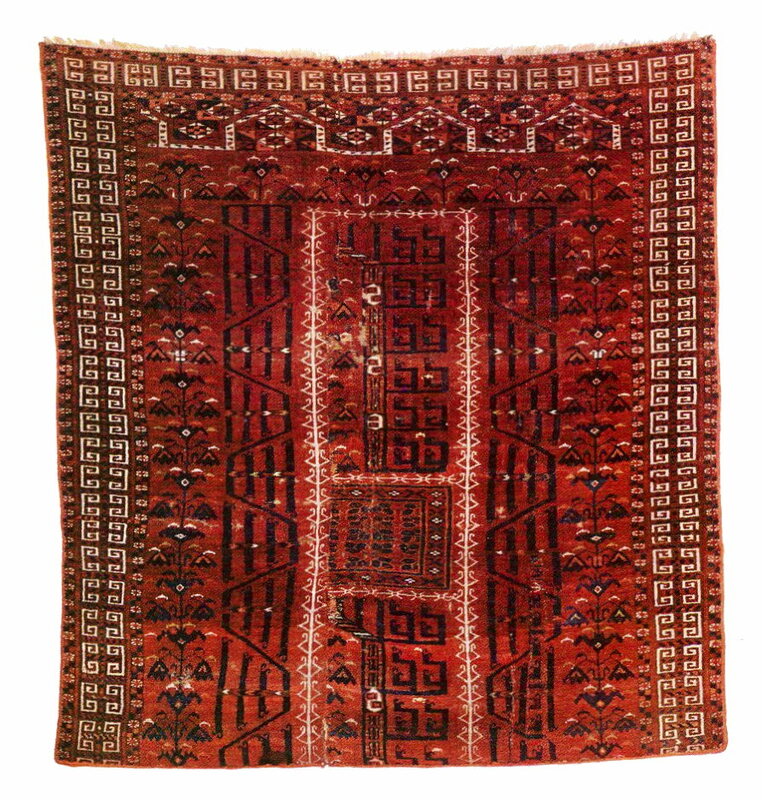 Smaller versions were also manufactured, as with the Lotto carpets.These comprise two vertical rows of plaited stars. A fragment in the Ballard Collection St.Louis,cut on the right hand side and expertly joined;a fact which seems to have escaped the cataloguer. 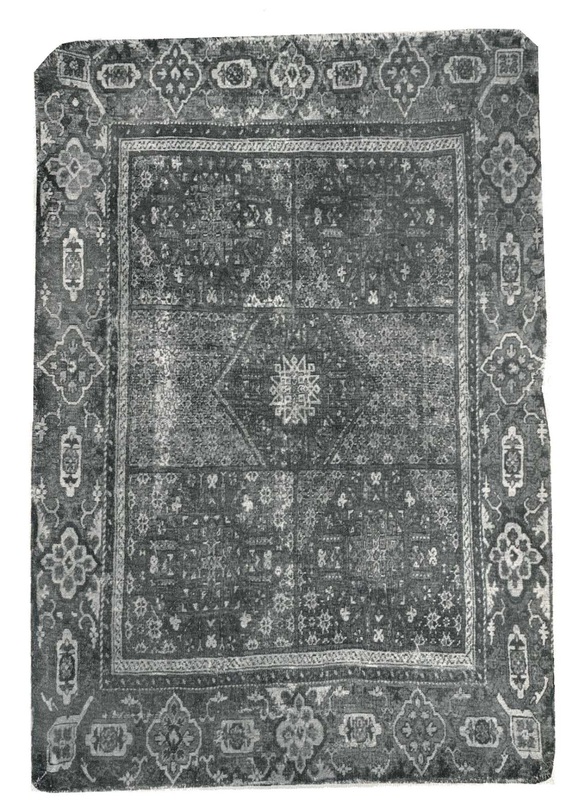 Published by Viale,this rug from the Barbieri Collection is the only example with a 2-1-2 layout. 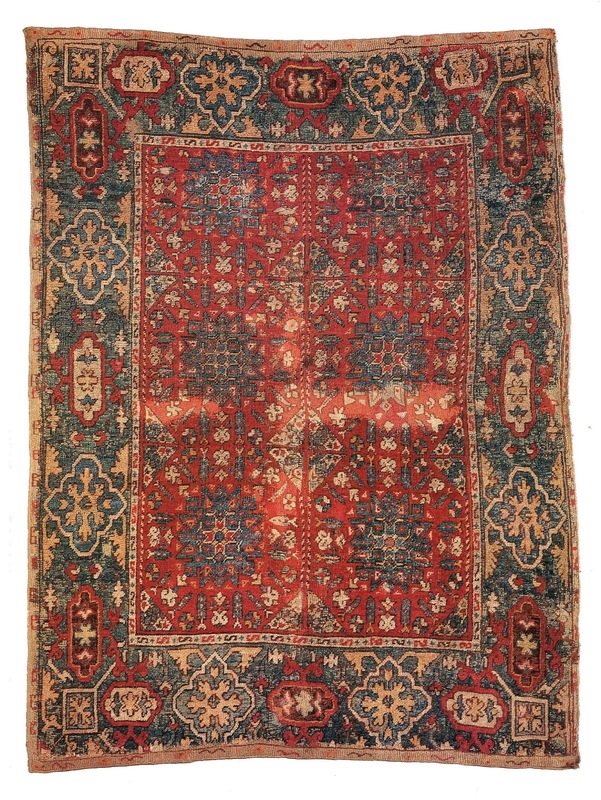 The Bernheimer carpet sold at their House Sale at Christies on 14 February 1996 for $24,800;great was the amazement when it fetched ten times as much at Christies on 16 October 2003 (lot 126) selling for $269,000. 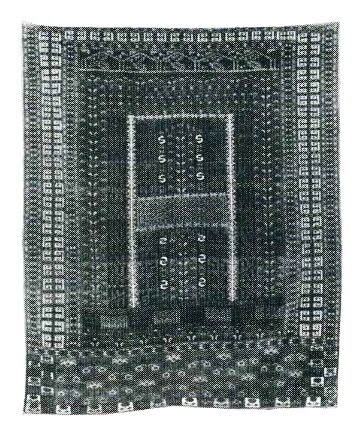 A rug from Cittone with bisected stars was advertised in Hali 5-4,1983. 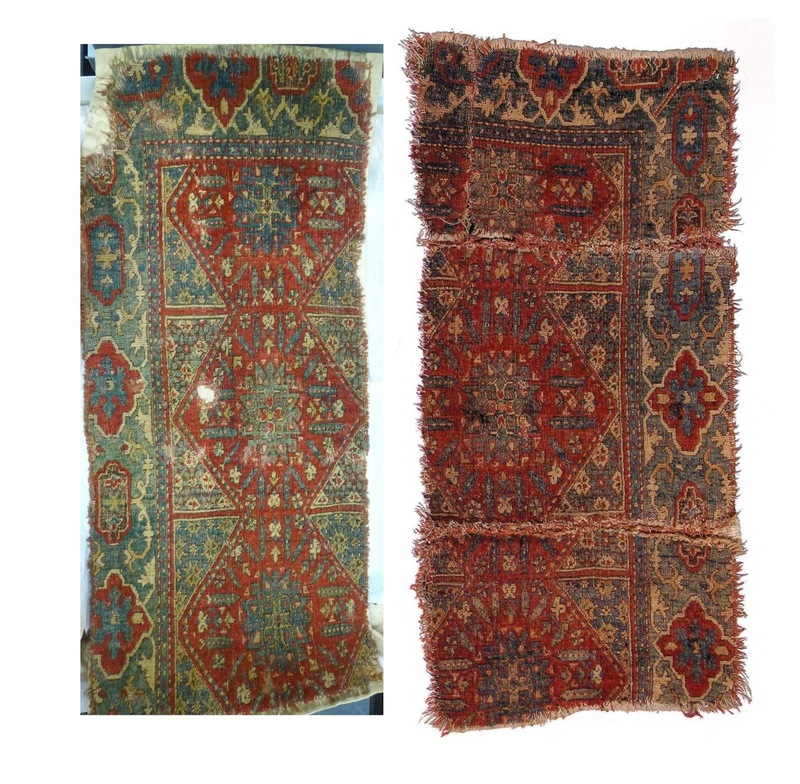 Fresh to the market and now in Doha,a rug with faded re-woven ends. 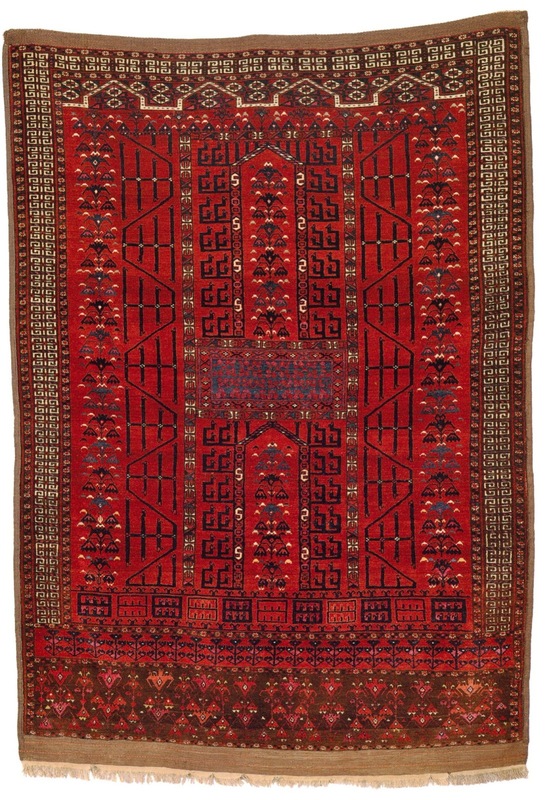 Exhibited in Hamburg in 1950,this ex -Huelsmann Collection piece was purchased by Eberhart Herrmann at the legendary Dörling Auction in Hamburg on 14 May 1985(lot 410)for 149,500 Deutschmark,and subsequently offered in Munich for 286,5000.The use of a dark blue in the border is unusual,but also occurs in the large Bode carpet in Berlin,and in a rug in the Burrell Collection. 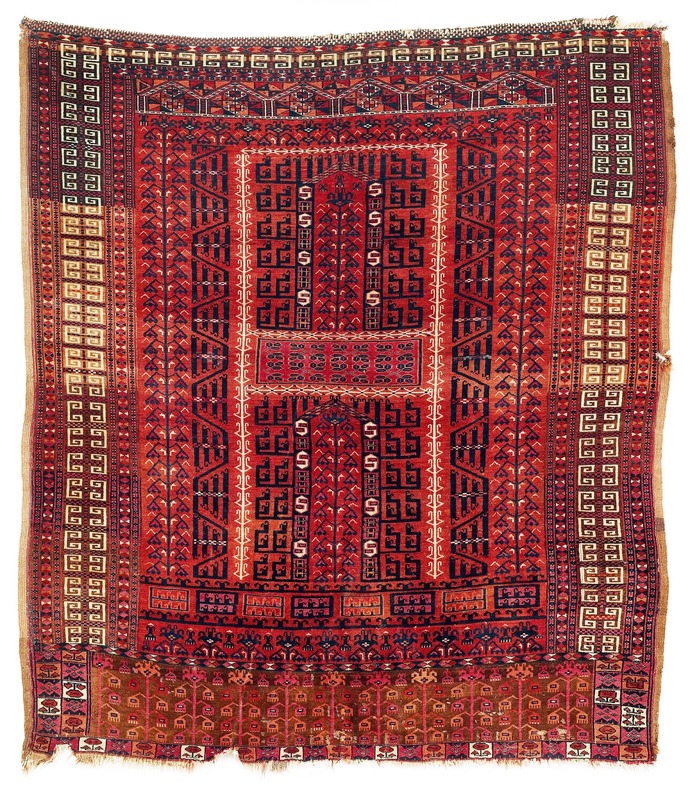 A rug formerly in the Hirth Collection,and now lost,is unusual for its 2 and 1 half elongated Hexagons. 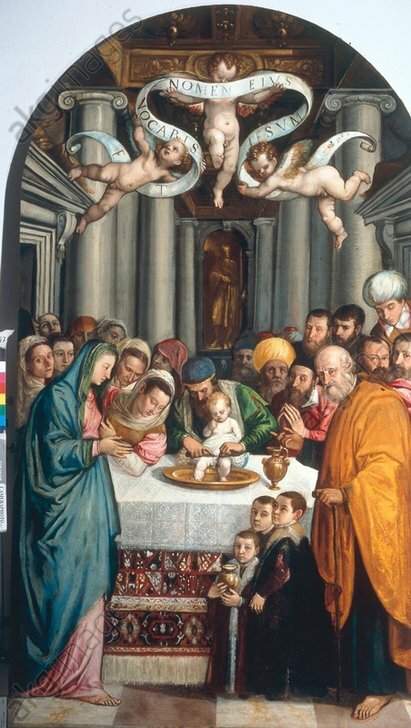 An example with pastel colours in the MAK,Vienna,is said to have been in the possession of the Kuefstein family since the middle of the 17th century. 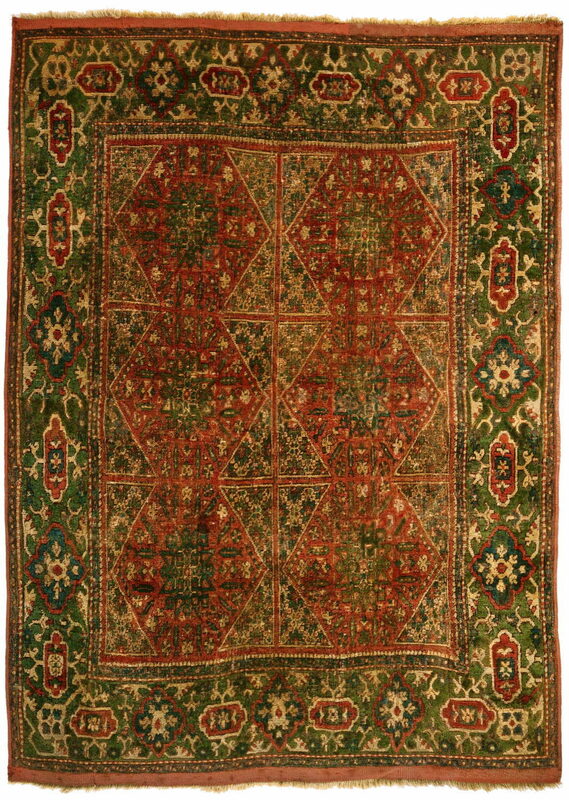 A rug in the Lees Williams Collection,Philadelphia,has been cut and rejoined through the center.The olive green border colour is unusual,and the palette resembles the large rug in London. 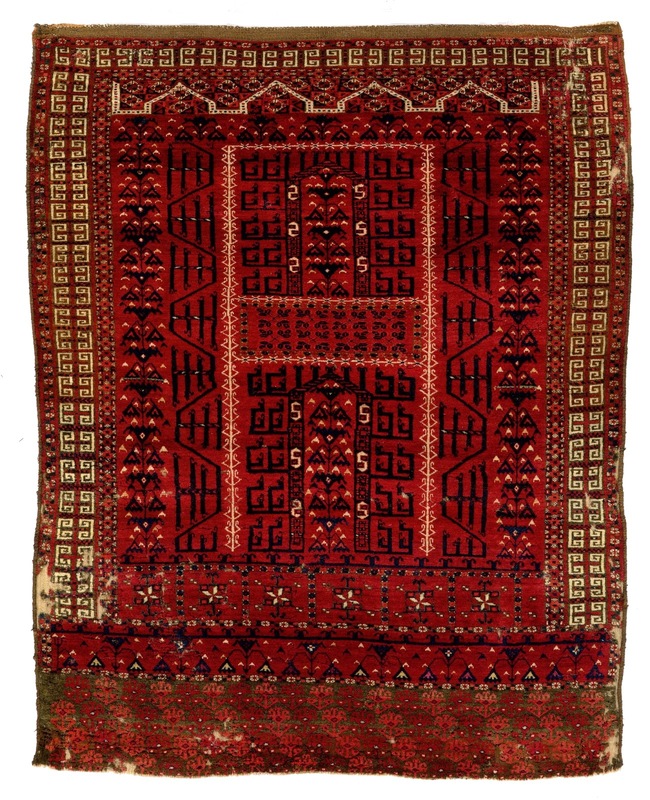 Purchased at the 1925 Benguiat sale,and now in the Textile Museum (R7.9)Ends and sides re-woven. 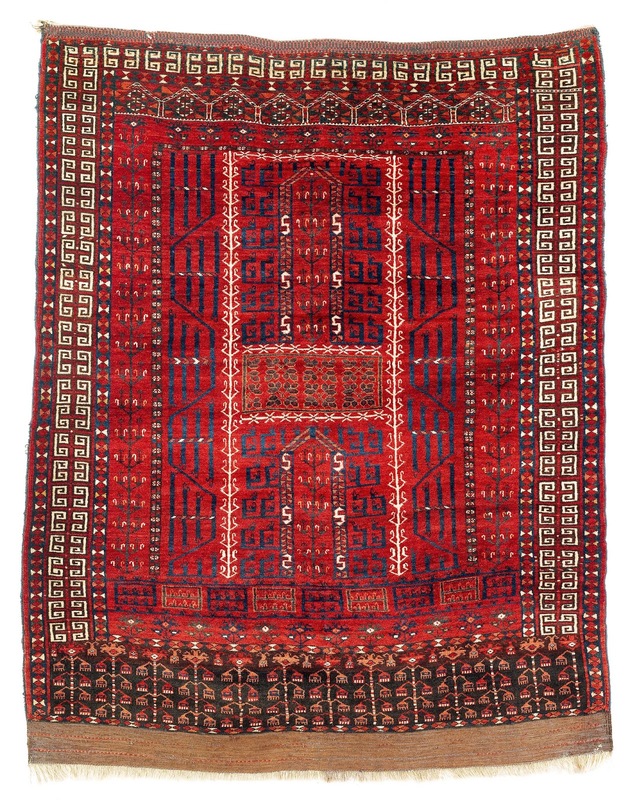 First offered at the Cassirer & Helbing Auction on 8 December 1925 (lot 23)from the Collection of Baron Tucher,this piece appeared at Rippon-Boswell on 16 November 1996 (lot 131) where it sold for $90,390.Its re-woven ends,already apparent in the 1925 photo,were now completely faded.Eleven years later it re-appeared at the same venue fully restored,but failed to sell. First sold at Lefevre`s for 32,000 GBP on 6 October 1978(Lot 39) the following subsequently appeared in Chris Alexander`s “Foreshadowing” opus,having spent the interim with Eskenazi.At the Alexander Sale at Christies on 15 October 1998 it seems to have been passed,only to resurface once more at Christies on 10 April 2008,selling for 43,700 GBP.The carpet has been cut in both directions,however it probably retains its original layout.As with the type A, only four large rugs have survived.Alexander noted the placement of the white plaited stars to form an outer and inner circle. Published by Bode, and then by Riegl in the 1892 Vienna Book (when it was freshly restored) by 1930 the repair to both ends had become apparent.Its border resembles the Pharaon-Willborg example,but is more elegant,with an inner guard of Selendi-like Birds.It was presented to the Berlin Museum by Geheimrat Bode in 1905. 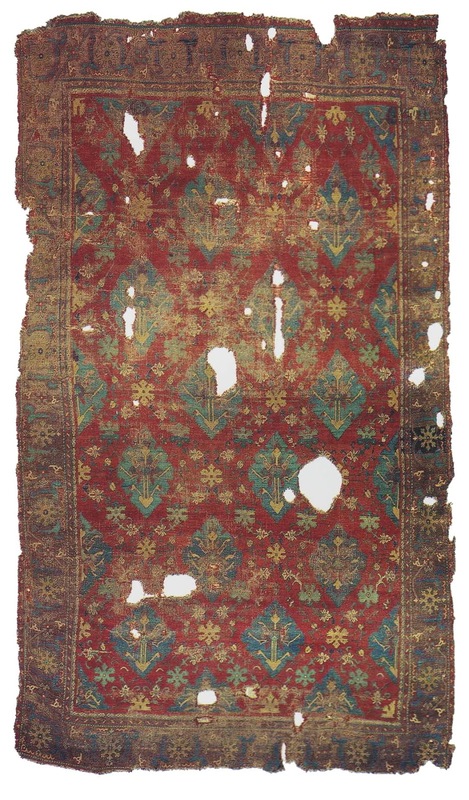 A sadly disfigured large carpet exhibited at the Munich ICOC in 1985,with the same border as the van Loo-al Sabah carpet.Perhaps proof that both types were produced concurrently,as Kühnel assumed.A small Chintamani border once surrounded the fragment. 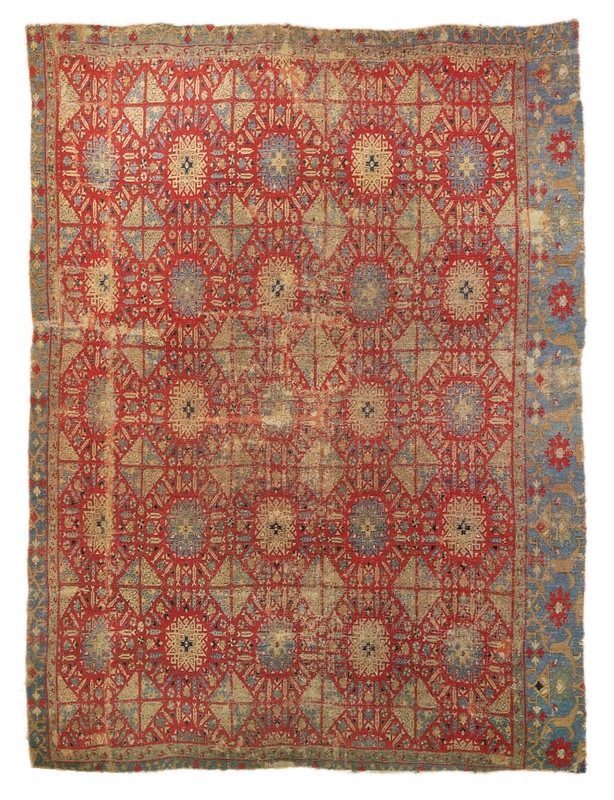 An original border of roses and palmettes on a 4 by 3 layout.The carpet,now in the Textile Museum Washington,was acquired from A.Loewi,Venice,in 1926. 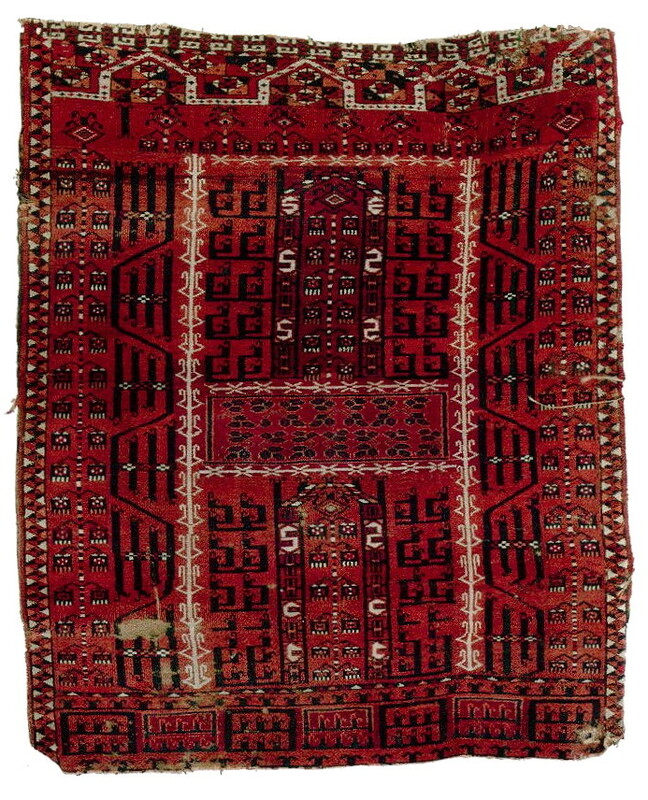 A carpet from the Marschall collection fetched a lowly $71,230 at the Austrian Auction Company on 16 September 2014(Lot 98)In the catalogue,and later in Hali 182,it was incorrectly ascribed to Ulrich Schürmann,who never published it. 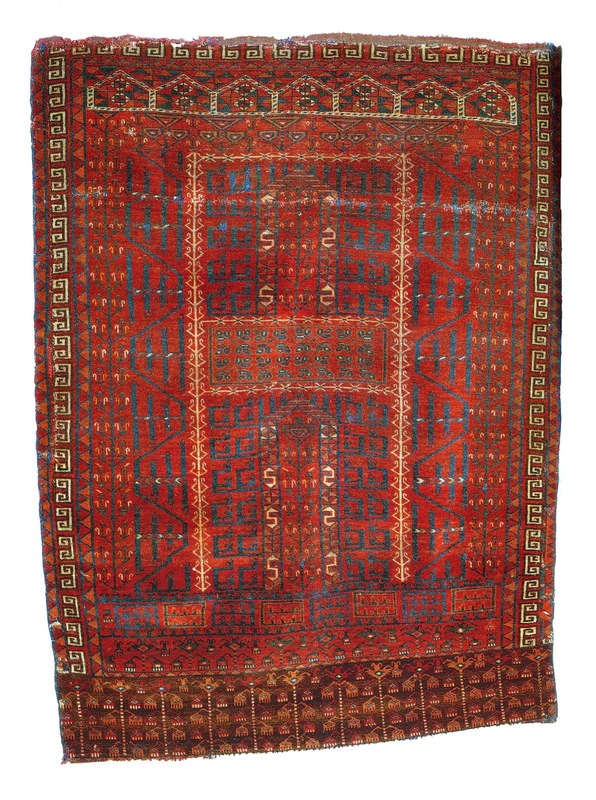 At Sothebys on 12 October 1978 (Lot 57)this rug later resurfaced in the Austrian Rug Society`s Anatolian Carpets volume from 1983,and was again published in the ICOC Austrian catalogue of 1986.It was sold at Christies on 14 October 1999(Lot 141) for $66,120.A sterling example where no real attempt has been made at a mitered corner solution.A row of Mamluke cypress trees,rare in the group,adorns the top end. 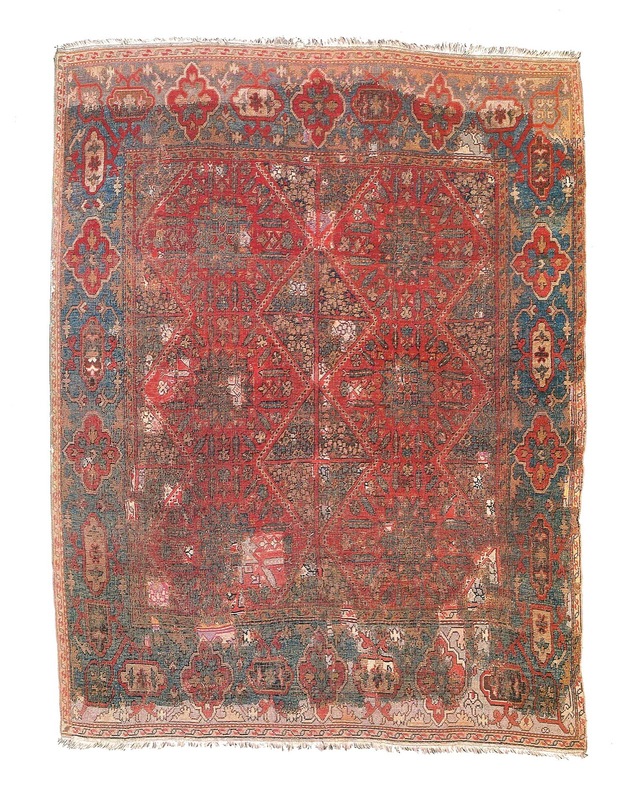 With Bausback at the 2015 Tefaf,this weathered but elegant rug was sold at Koller`s on 13 September 1986 ( Lot 141 ) for $ 66,120. 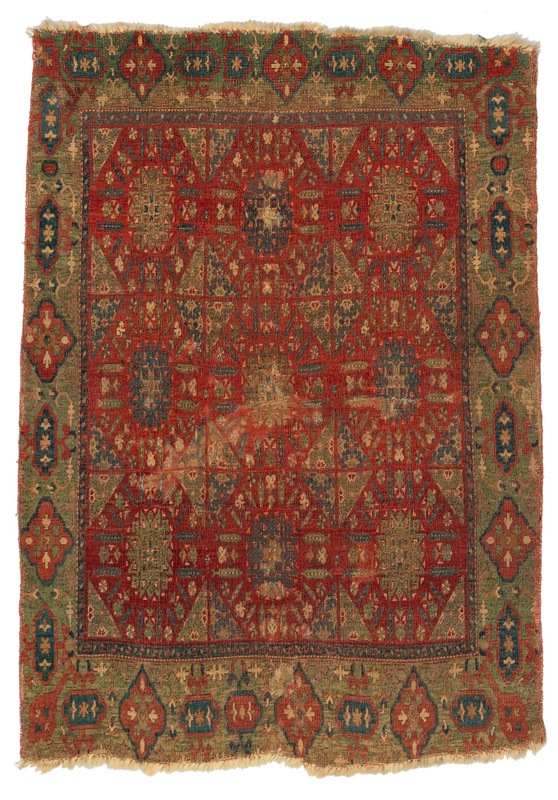 A rug from the Manilow Collection with an unusual border of connected medallions was on offer at Sothebys on 7 April 1992(Lot 69) for $40,000-60,000. 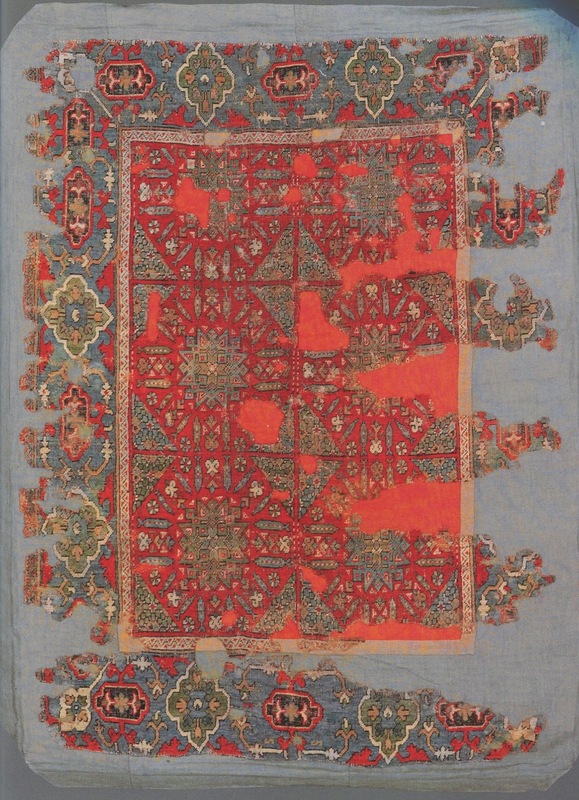 A fragmented example published by Eskenazi in 1982 reappeared at Christies in 2011 and 2013,but to no avail. 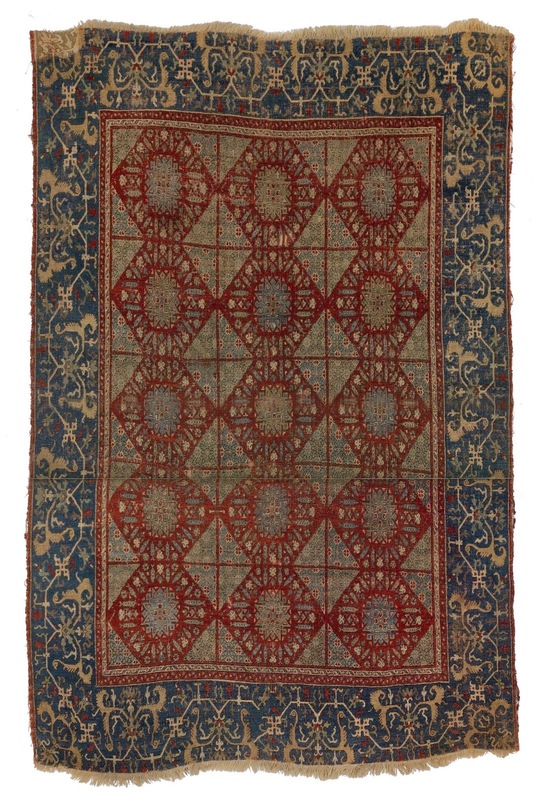 The Burrell Collection rug with rare dark blue border. 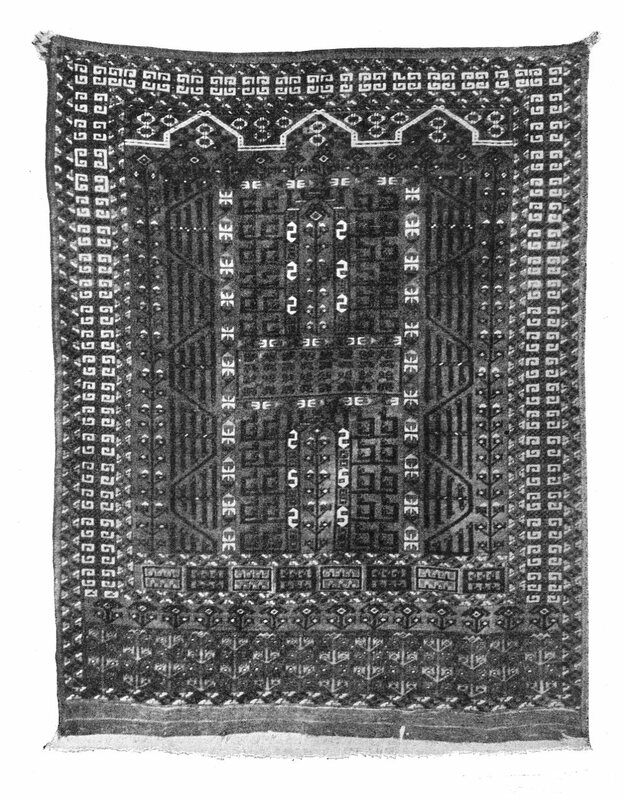 A second carpet published by F.R Martin in 1908 from the defunct Düsseldorf Museum of Arts and Crafts. 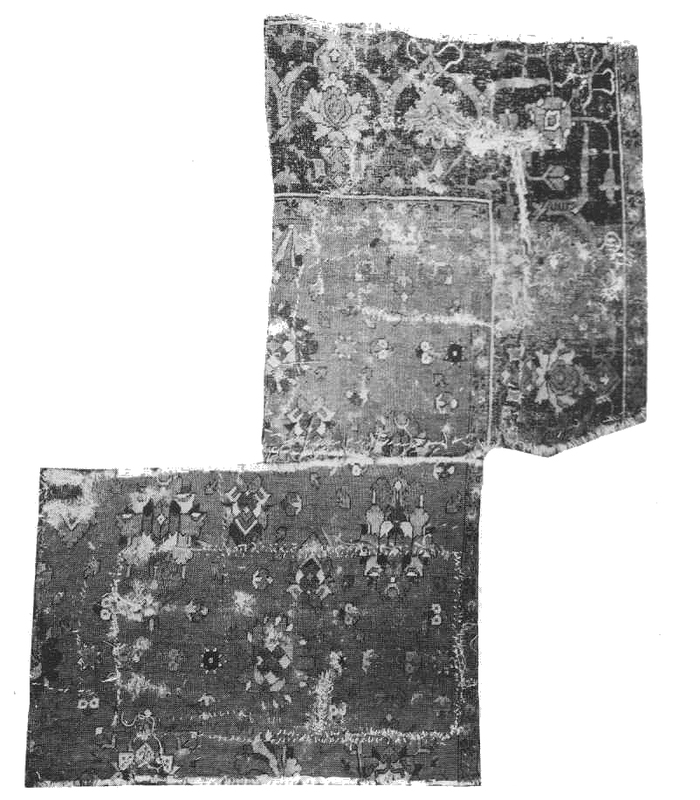 Approximately 40 % of the small carpets shown here are of the two row variety.The others are three by three,with a few variants. The Jaquemart-Andre Museum in Paris is fortunate to house three such pieces. 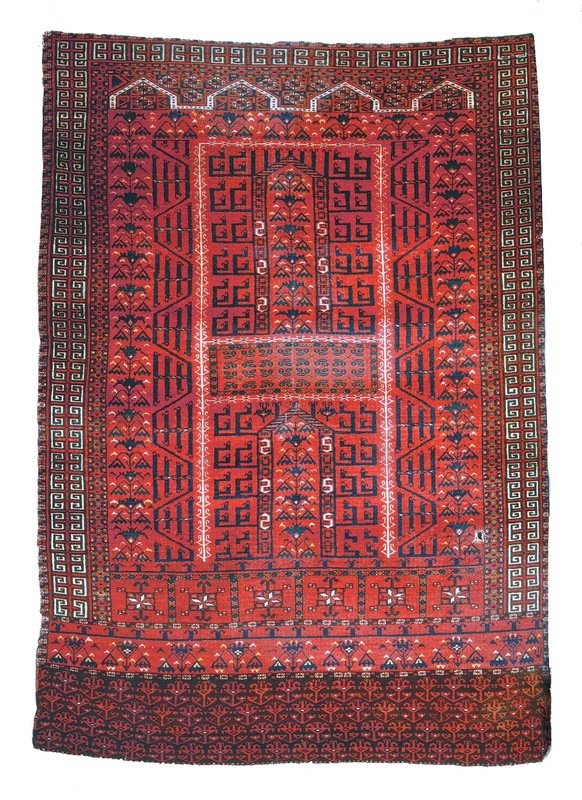 A rug in the Textile Museum has an interrupted break in the border pattern.No colour photo seems to exist. 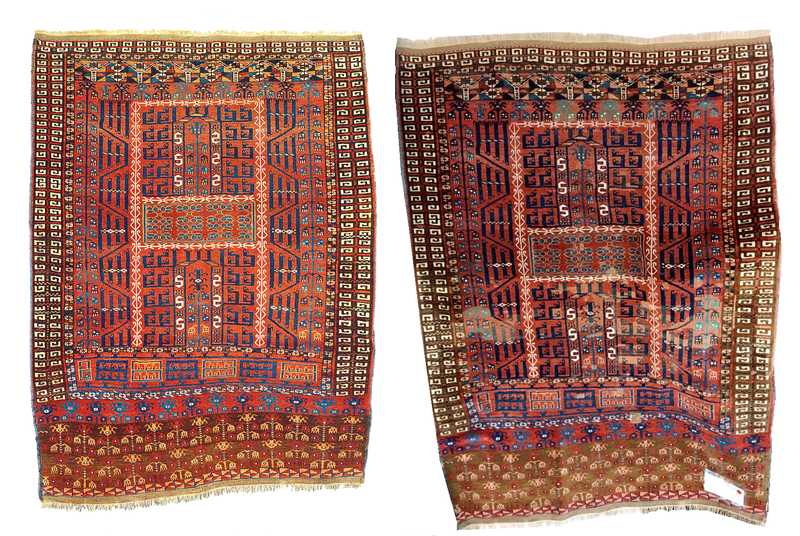 The same border repeat with the McMullan example now in the Metropolitan Museum of Art,but in the three row version. 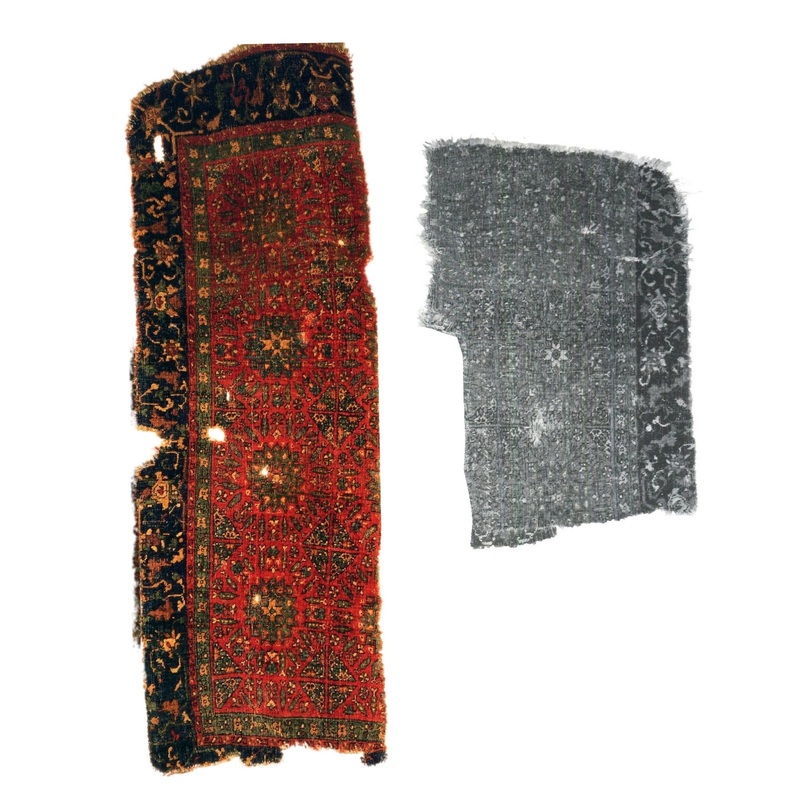 The Victoria & Albert Museum`s large version,very damaged,with an olive blue-green,acquired in 1884. 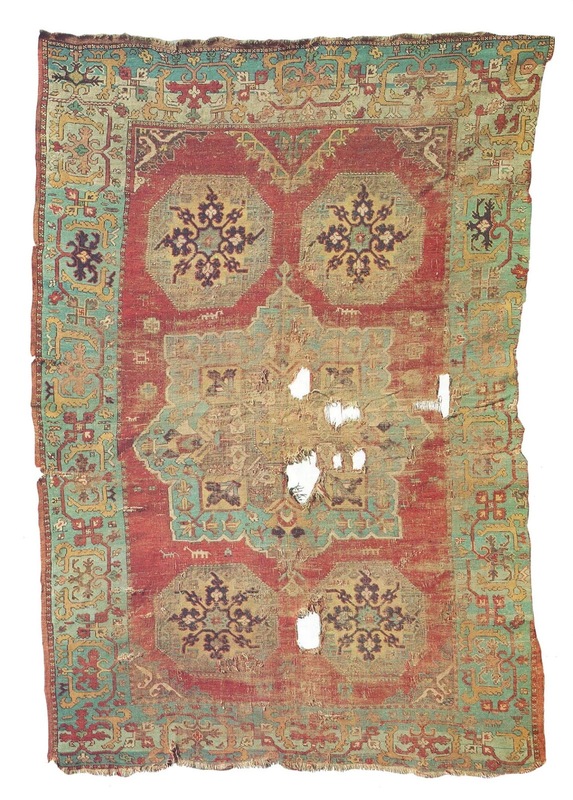 Acquired by the Kunstgewebemuseum Berlin in 1876,this fragment may have had the layout of the Bode carpet with Ushak-Vase carpet border,but its original size is impossible to calculate.Some possibilities are presented here. 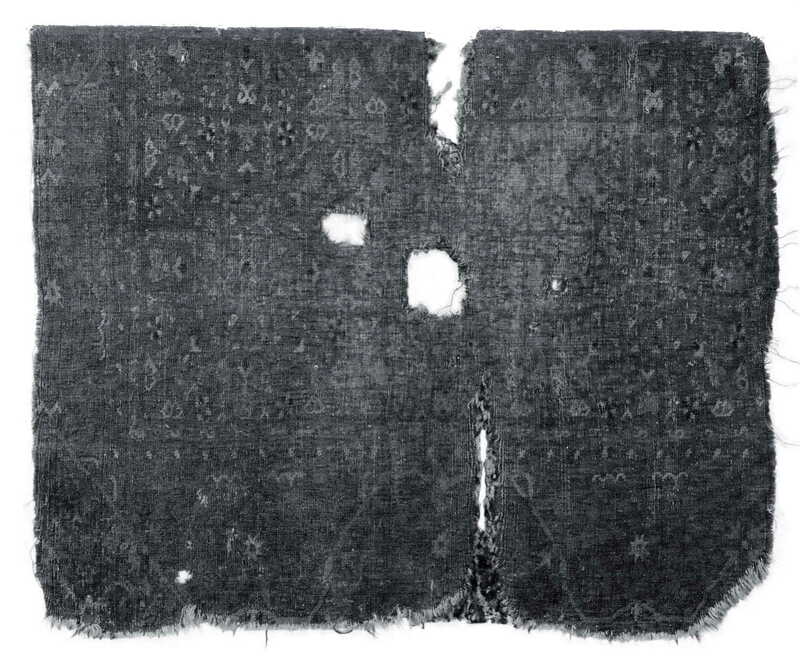 A two row fragment from the Keir Collection. 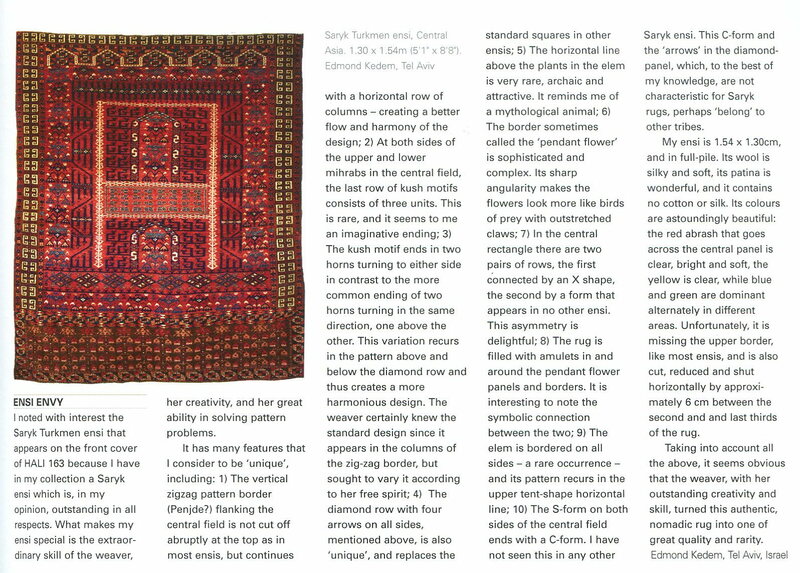 Published by the Textile Gallery in Hali 37. 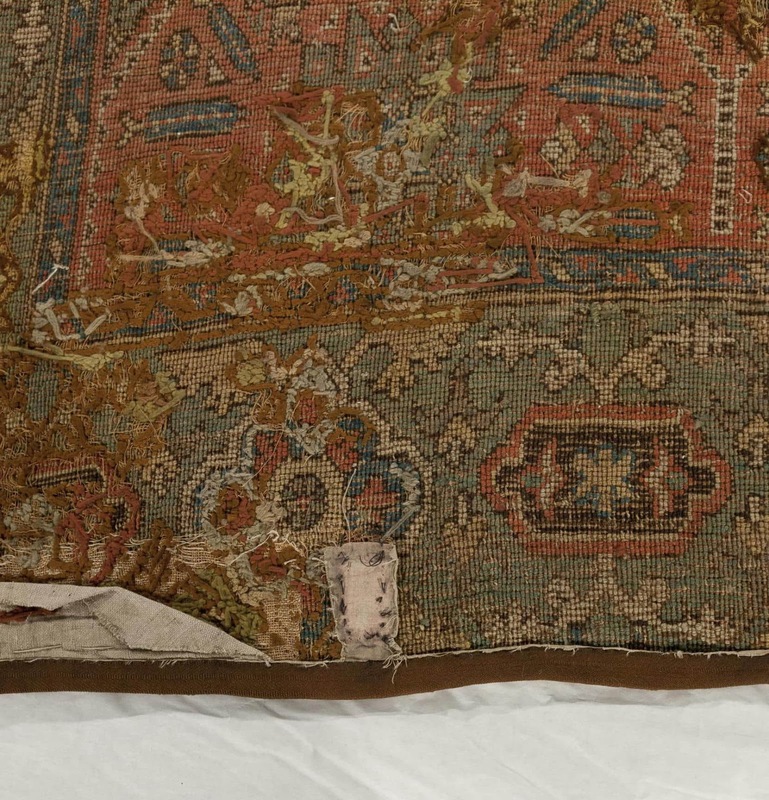 A rug in the Wher Collection has a strange pattern break in the upper and lower borders,also seen on the Mounsey-Christies piece from 2014. 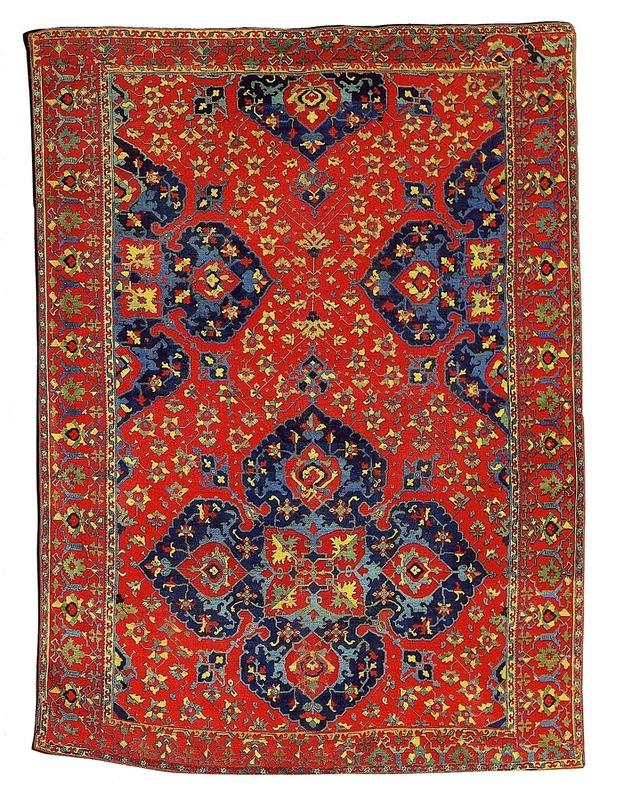 Aside from the main group a few more examples may be included .Most prominent is a carpet in Berlin with a pseudo-Isfahan design in which large arabesques seem smeared over a red ground. 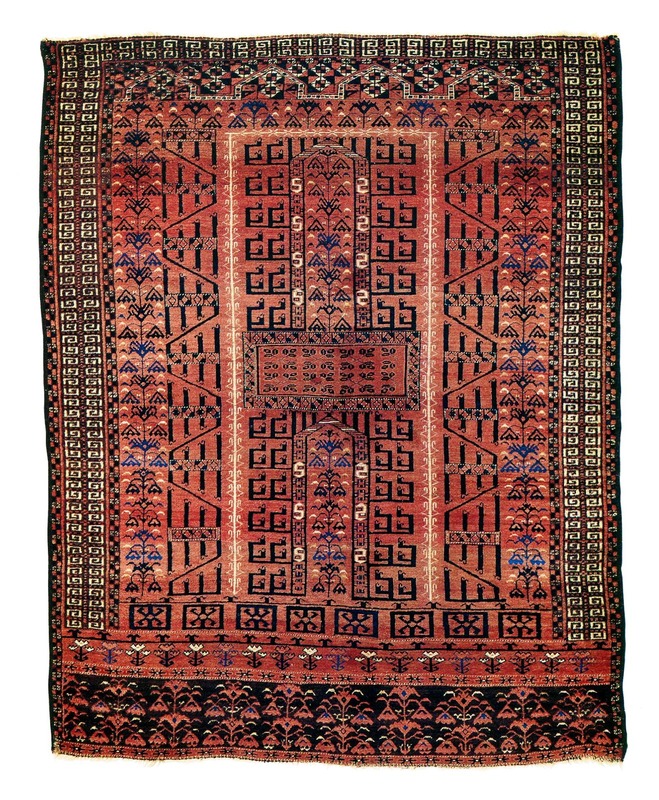 Equally rare is a carpet once with Alex Zadah(1993,ICOC Catalogue Berlin) and also Eberhart Herrmann(1994-95,ATT V),but which also made an unfortunate appearance at Sothebys in 1994.It resembles the Ballard Ushak rug minus its Quatrefoils. 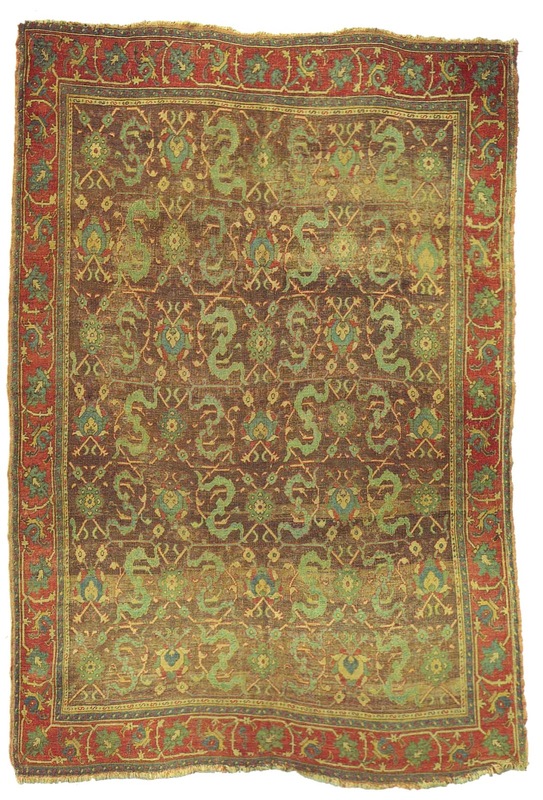 A similar fragmented example is in the Keir Collection. 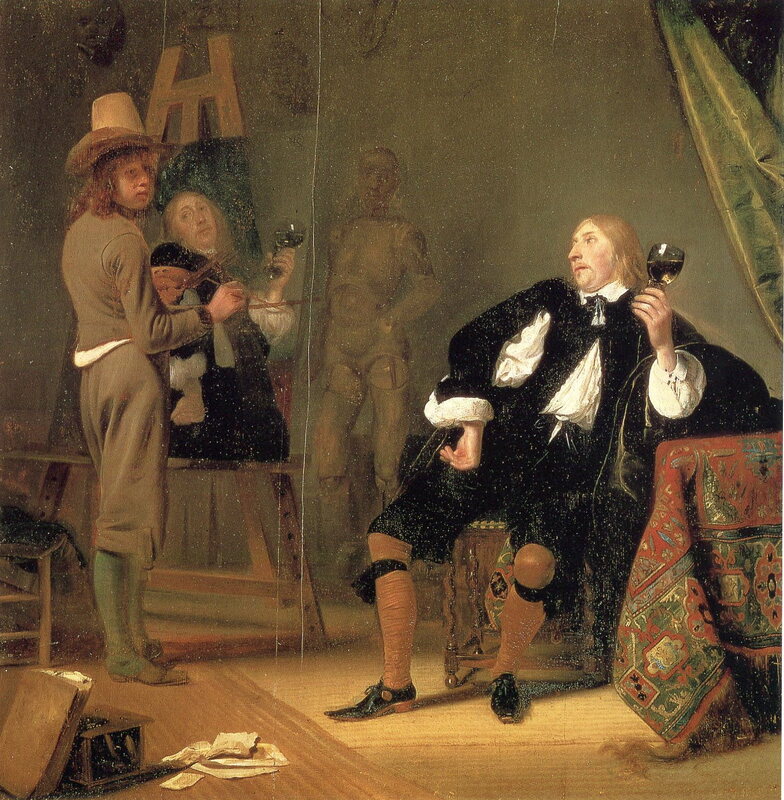 A degenerate example was at Winthertur in the du Pont Collection,via Benguiat. 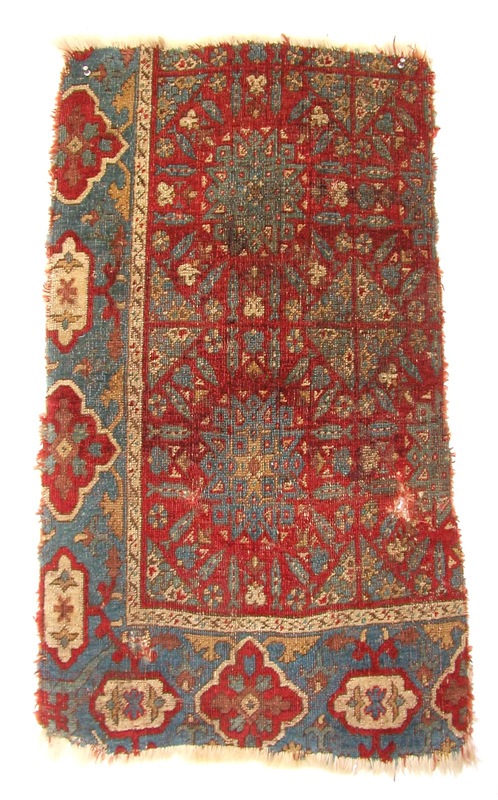 Two superlative example found at Divrigi,both Persian-knotted,may qualify for a place in the group. 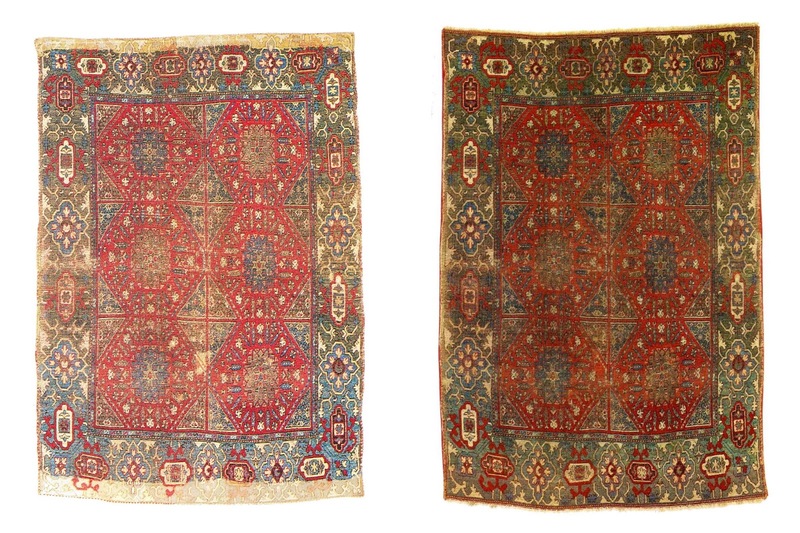 Two magnificent Ushak-style carpets,known to Ellis in 1988 but published by Ertug(1996 & 1999) were retrieved from a mosque in Elazig. Very few fragments exist;four items are known from the Keir Collection,two of which have pendants in the Victoria and Albert Museum. 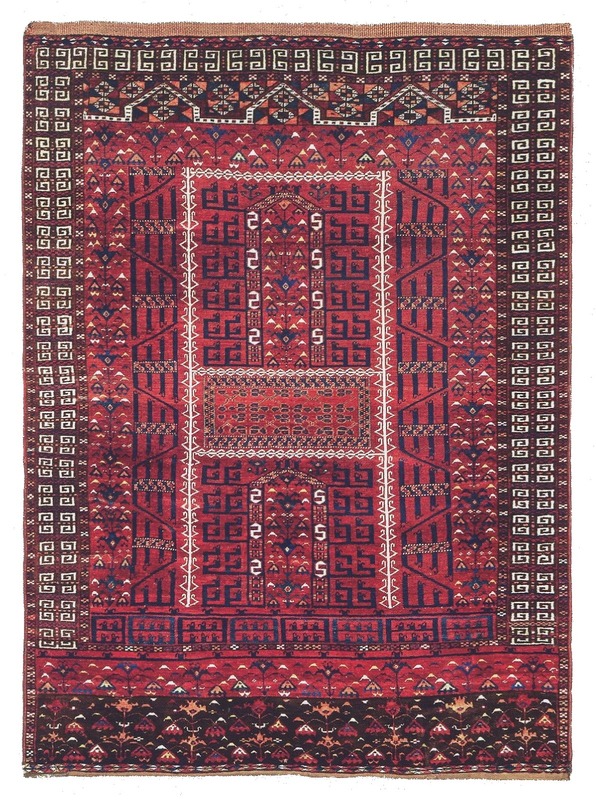 A virtually unreadable piece was at Sothebys on 12 October 1978,Lot 58. 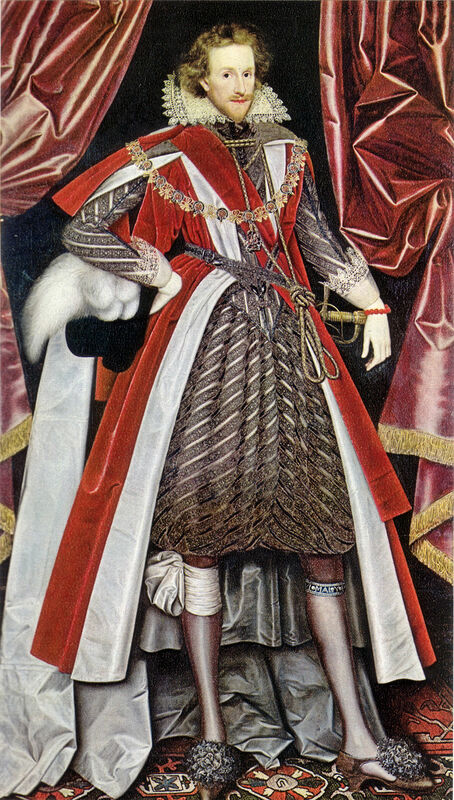 Lately with Peter Bausback,said to hail from Wallenstein castle,with a border similar to the lost Düsseldorf rug. 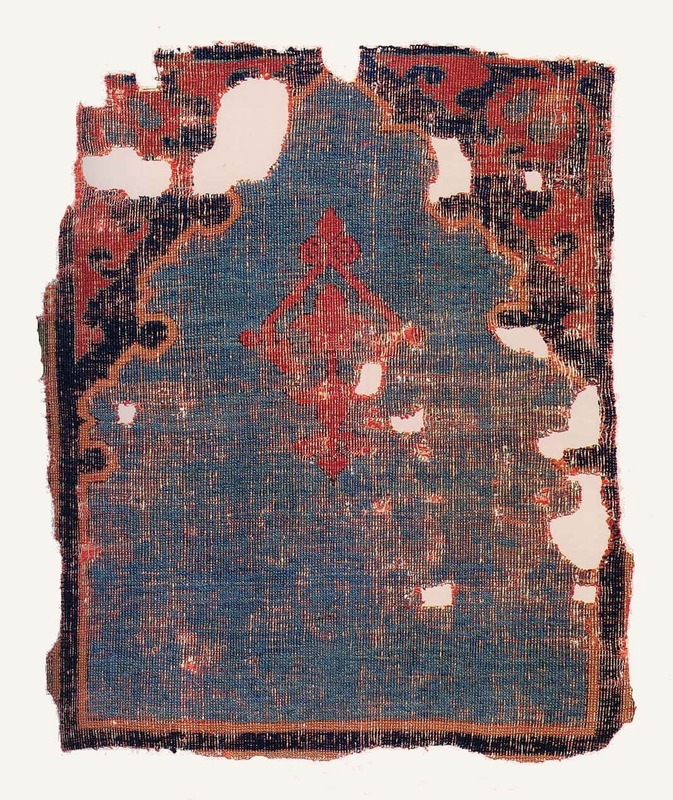 One very small prayer rug exists,which may have formed part of a Saf. 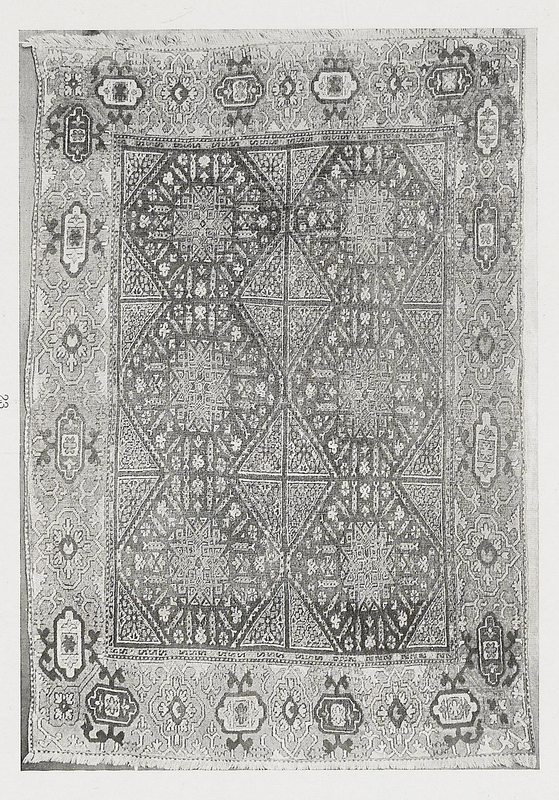 A fragment from the Wolf Collection,once with Friedrich Spuhler and now in the MET,has a Caucasian style allover palmette design paired with a Cairene Chintamani border. 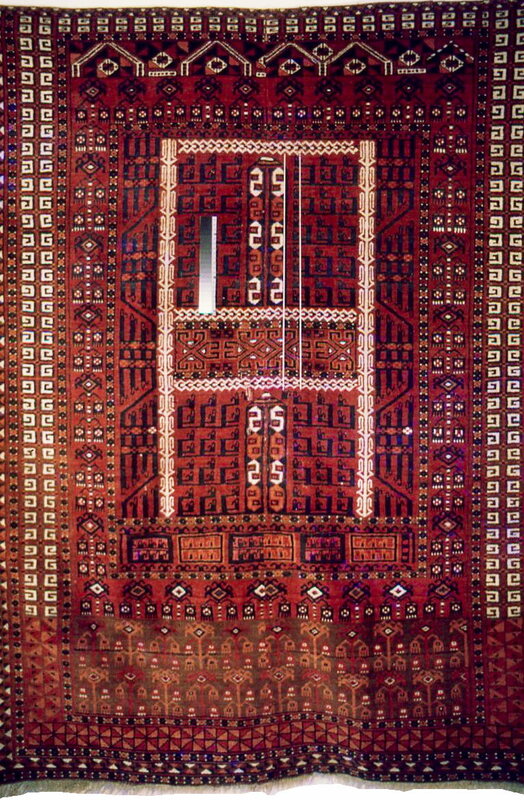 Bier,Carol-Beyond the Pyramids,1991;Mamluk Rugs from Egypt,2003;Spanish and Mamluk Carpets,2004. 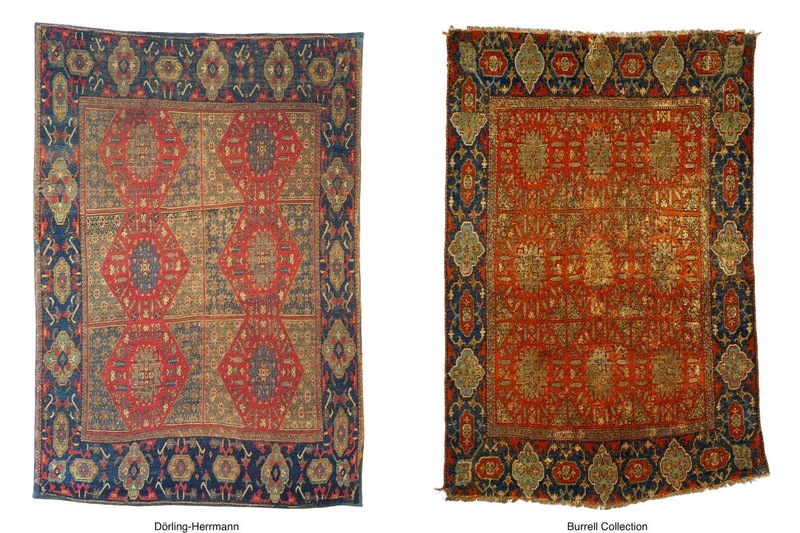 de Unger,Edmund-An Ancestor of the Mamluk Carpets-Hali 5-1-44;The Silk Mamluk-Hali 31-8. 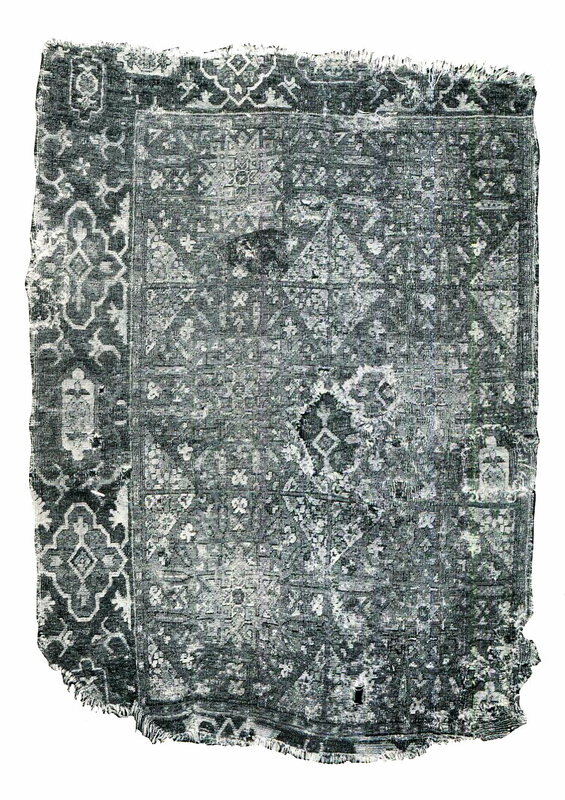 Tunsch,Thomas-Beziehungen in der Komposition und Ornamentik Mamlukischer Bucheinbänder und Teppiche,7th ICOC,Papers 1993. Copyright © www.rugtracker.com 2012.All rights reserved.. Simple theme. Powered by Blogger.